So much for Bloom Day here in southeastern Pennsylvania. We had flowers 2 weeks ago, even 3 weeks ago, but in the last week, May turned into January, and for the past few days, we’ve stayed below freezing and been buried in sleet and snow. In between shoveling sessions, I’ve resorted to pulling from my photo archives so I can write about another favorite subject: variegated plants. 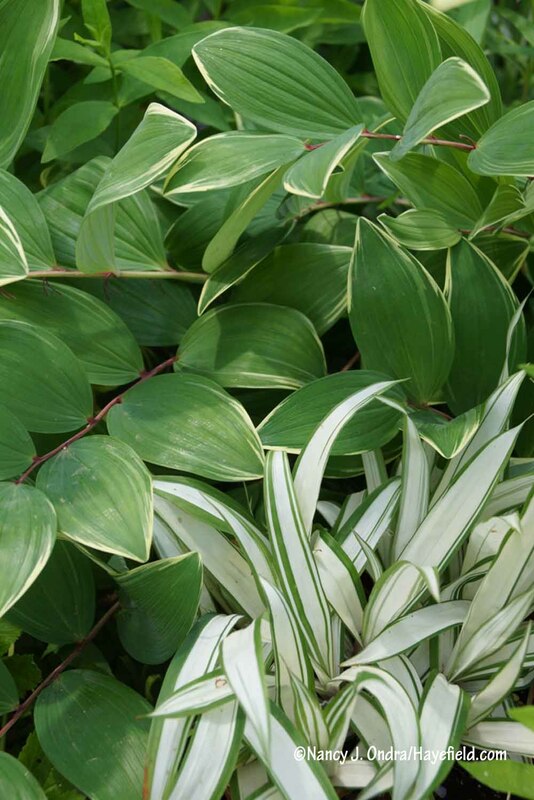 Spots, splashes, streaks, and margin markings: These and other sorts of variegation add an extra element of interest to lovely leaves. The visual effect can range from subtle to gaudy, and from elegant to somewhat sickly, depending on the pattern, intensity, and colors. If you’re a collector, you may adore them all; if you’re a bit more discerning, you may appreciate some kinds and be appalled by others. 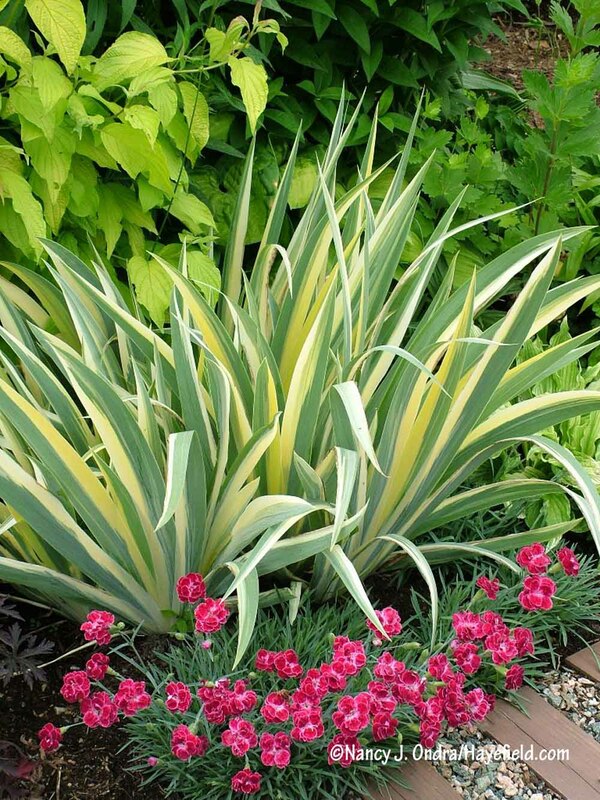 Whatever your preferences, variegated plants can offer some intriguing design possibilities if you use them wisely. 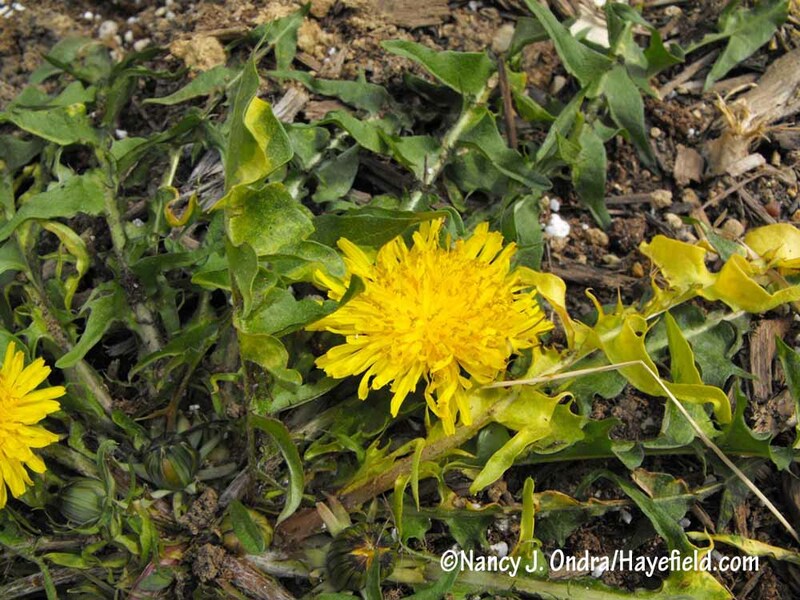 Variegated dandelion (Taraxacum officinale): a multicolor only a collector could love. 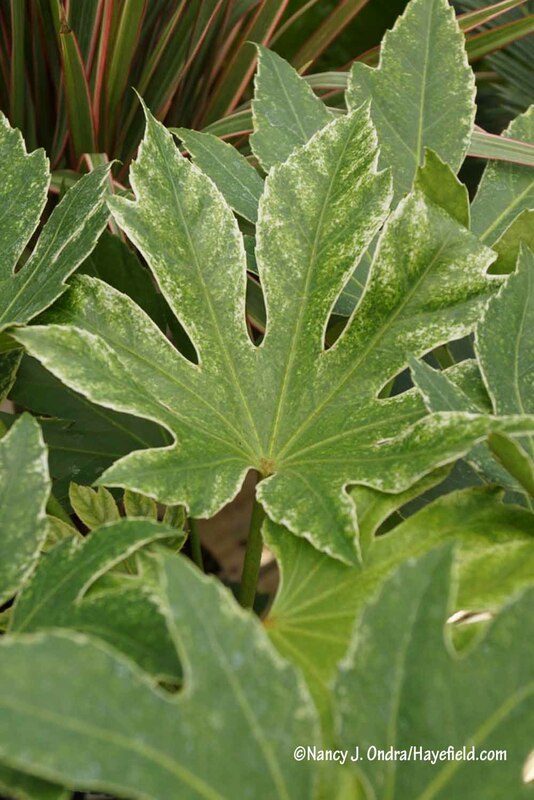 ‘Spider’s Web’ Japanese aralia (Fatsia japonica) can be very attractive when it’s well grown, but when I try it, it just looks like it has a bad case of spider mites. 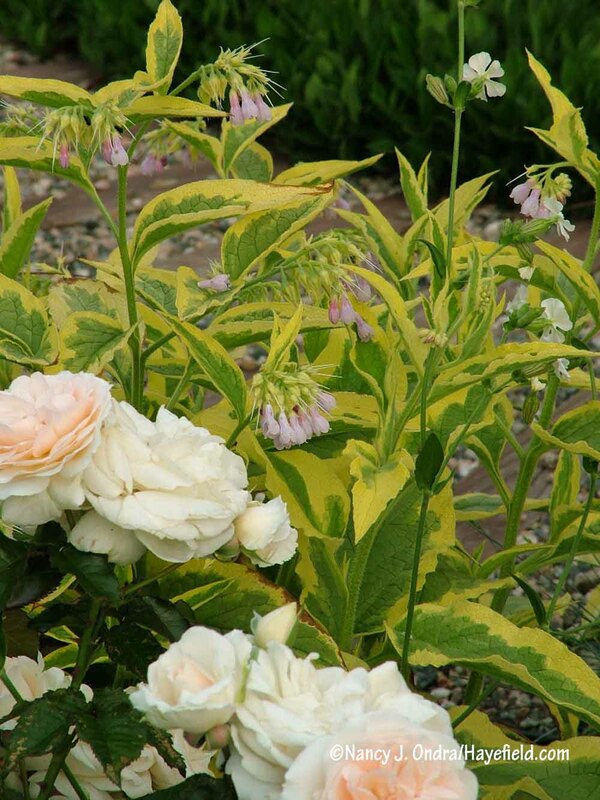 Now, that’s my idea of a gorgeous plant: the emphatically variegated ‘Axminster Gold’ Russian comfrey (Symphytum x uplandicum)–here paired with ‘Auslese’ lady’s mantle (Alchemilla mollis). First, consider the site. Seen from a distance, all but the boldest variegates tend to have a pale or washed-out look: fine if you want a soft color but disappointing if you want to appreciate the details of the markings. Up close, you can see that the narrow blades of ‘Morning Light’ miscanthus (Miscanthus sinensis) have fine white striping. From more than a few feet away, the whole plant looks pale green to gray-green. The foliage of variegated wayfaringtree (Viburnum lantana) is heavily splashed and speckled with yellow, but there’s not much contrast with the green parts, particularly when the leaves are young. Seen across the garden, variegated wayfaring tree (Viburnum lantana ‘Variegatum’) doesn’t even look multicolored: just an overall greenish yellow. 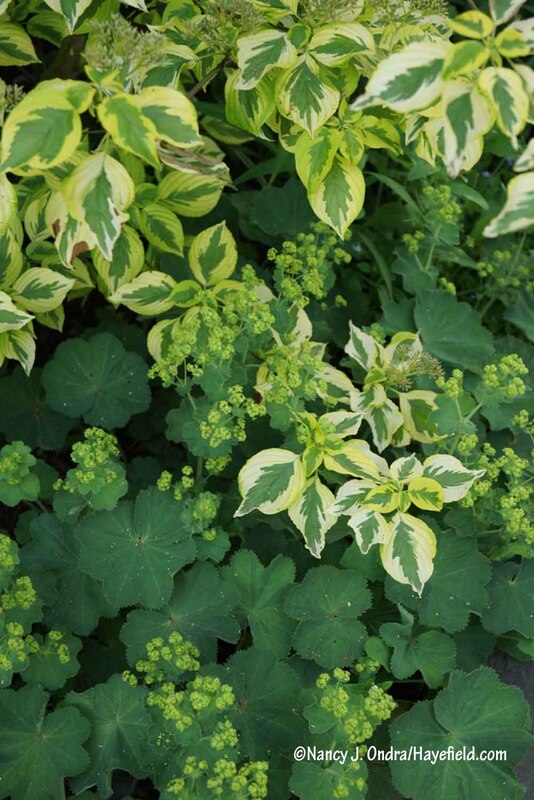 Very subtle variegation patterns, and any markings on small leaves, show off best at very close range, so consider keeping them close to a path or bench. 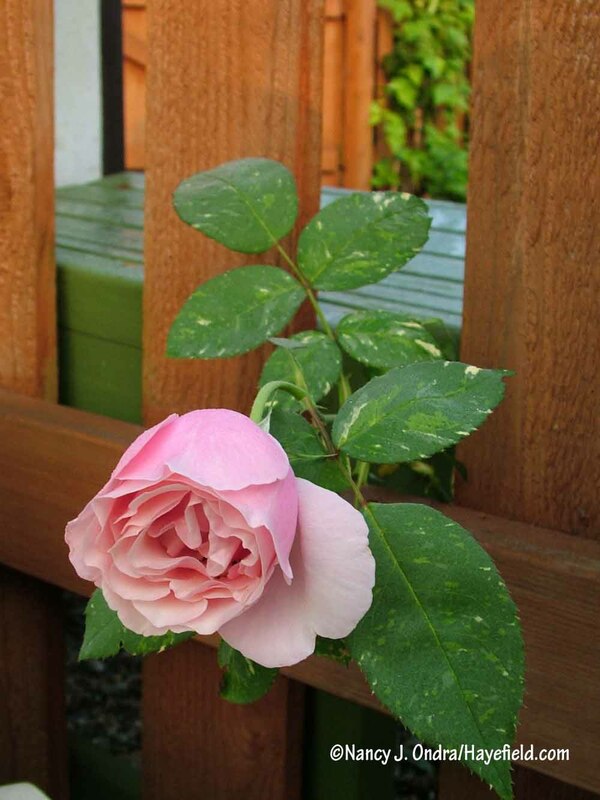 The markings on ‘Verschuren’ hybrid tea rose can be so subtle that they’d get lost in a large border. Each leaflet of variegated rock cotoneaster (Cotoneaster horizontalis ‘Variegatus’) is edged with white. 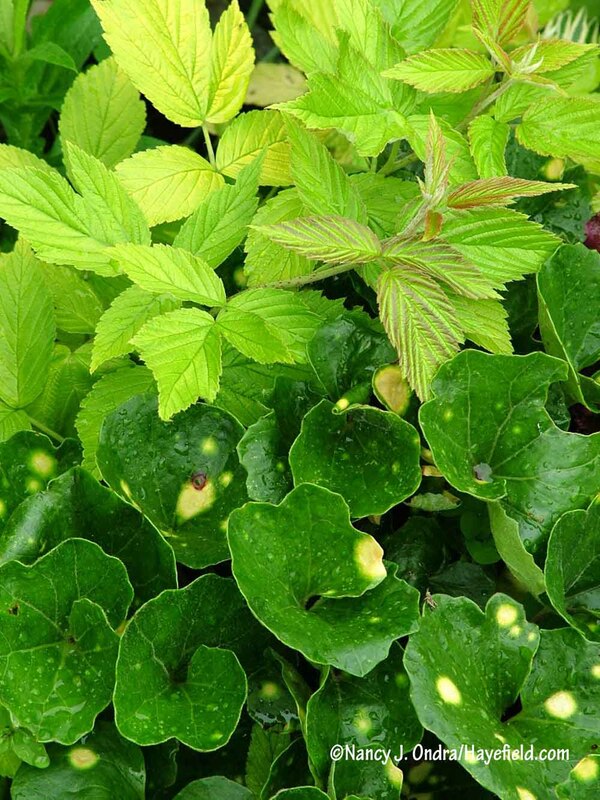 The leaves are abundant, but you’ll miss their elegant edging unless you keep the plant close to a path. 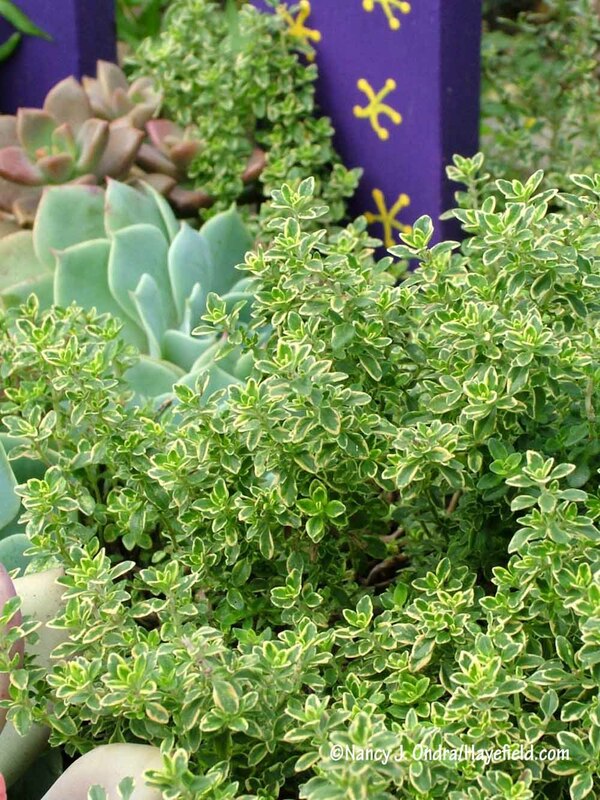 Variegated lemon thyme (Thymus x citriodorus ‘Variegatus’) is another tiny-leaved beauty that shows off best along a path, atop a wall, or in a container. 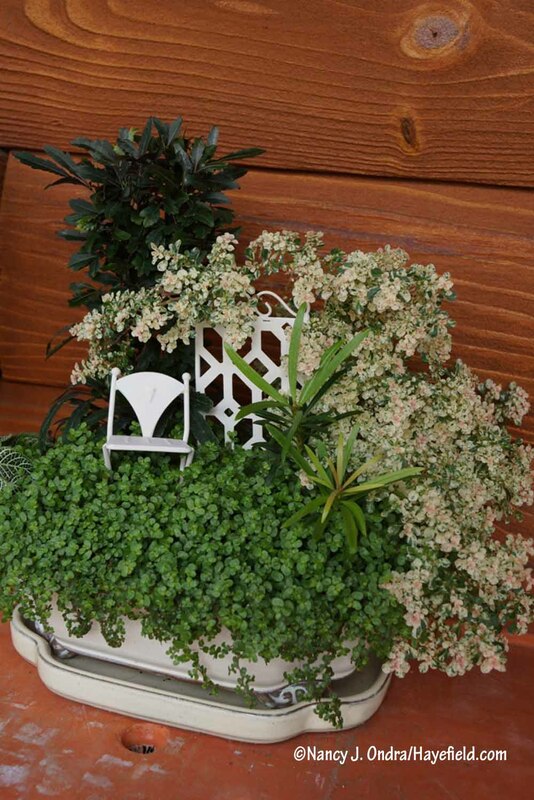 Containers offer excellent opportunities for showcasing special variegates. Give each one its own pot, or have fun experimenting with combinations. 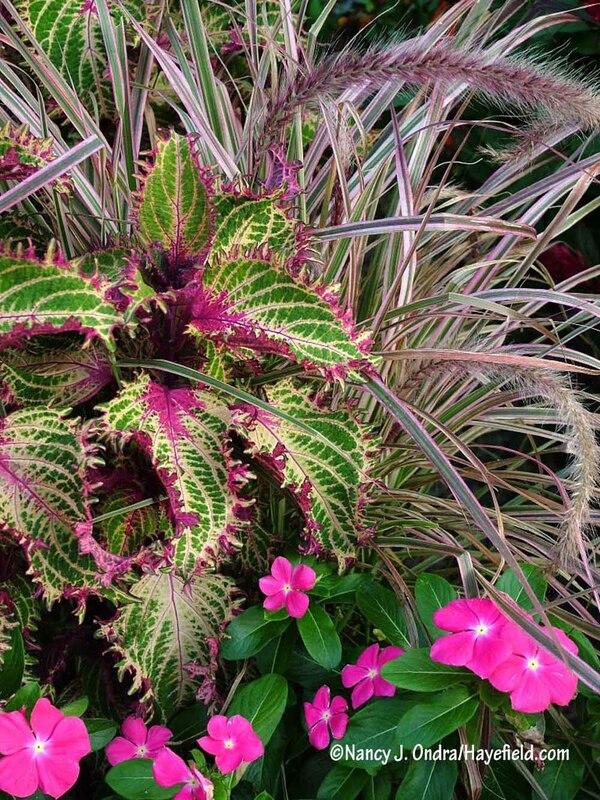 This container combination is pretty wild, but I think it works: ‘Pink Ruffles’ coleus and ‘Cherry Sparkler’ fountain grass (Pennisetum setaceum) with ‘Titan Rose’ rose periwinkle (Catharanthus roseus). 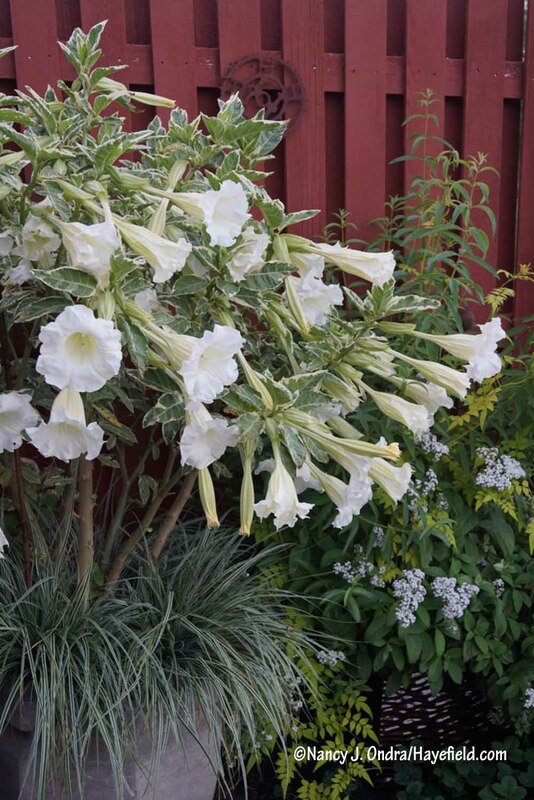 Even when not in bloom, variegated angel’s trumpet (Brugmansia suaveolens ‘Variegata’) is showy; in full flower, it’s outstanding. 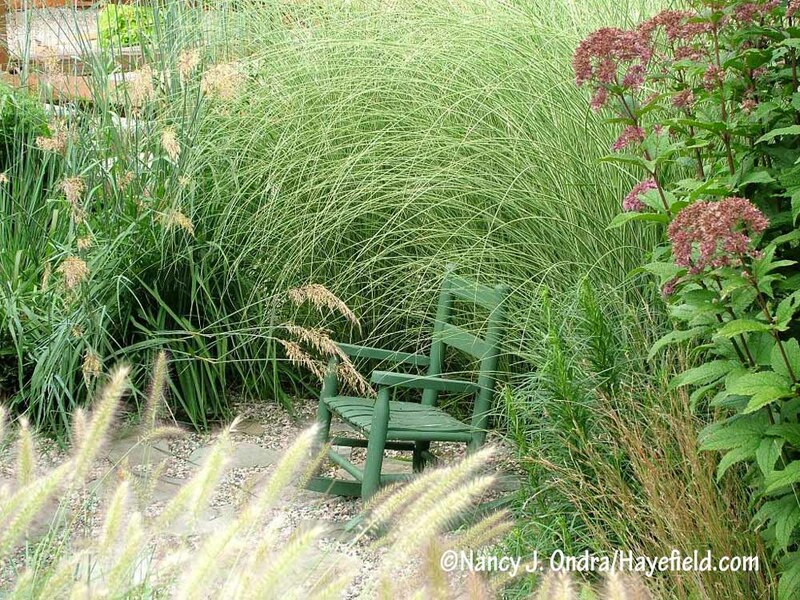 Here’s it’s in a large container, underplanted with ‘Everest’ sedge (Carex oshimensis). 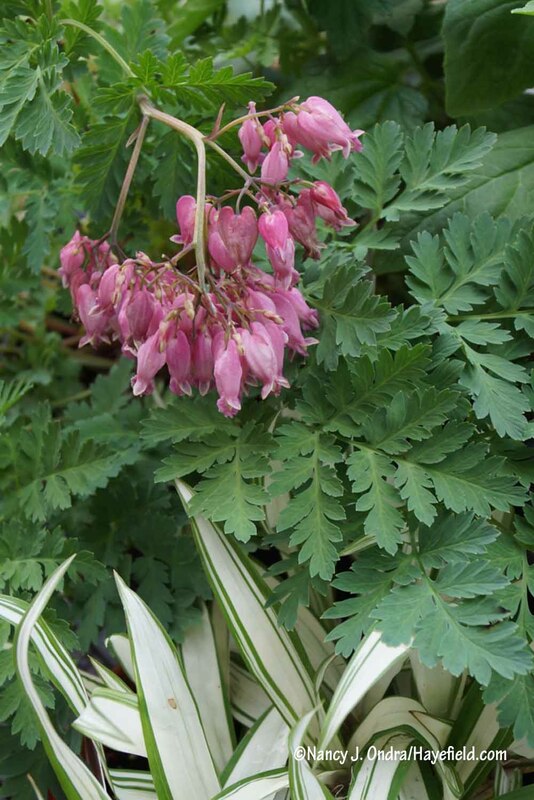 The solid greens of baby’s tears (Soleirolia soleirolii), podocarpus (Podocarpus macrophyllus), and false aralia (Dizygotheca elegantissima) make a quiet setting for the pink-, white-and-green foliage of variegated artillery plant (Pilea microphyllus ‘Variegatus’) in this tiny tabletop container. 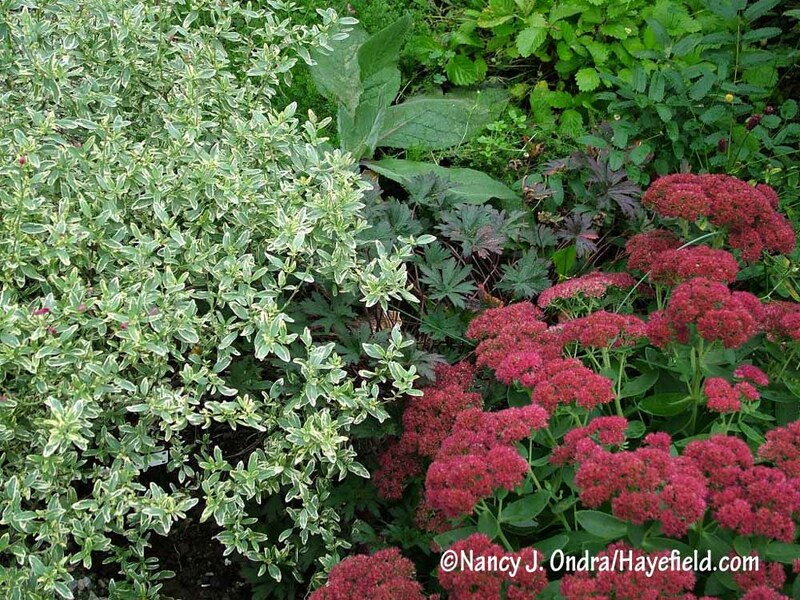 When you’re choosing partners for variegated plants, there are several ways to go. 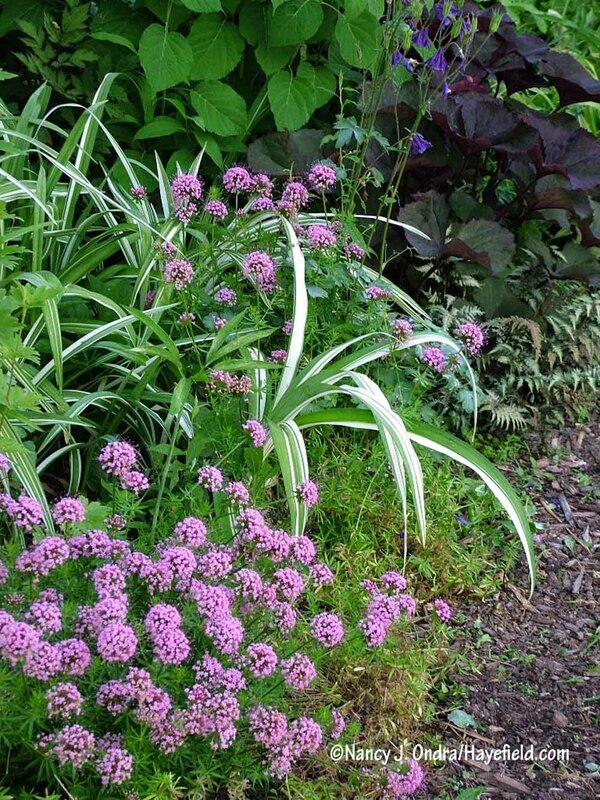 First, you could let the variegate be the star by setting it among solid-colored foliage. 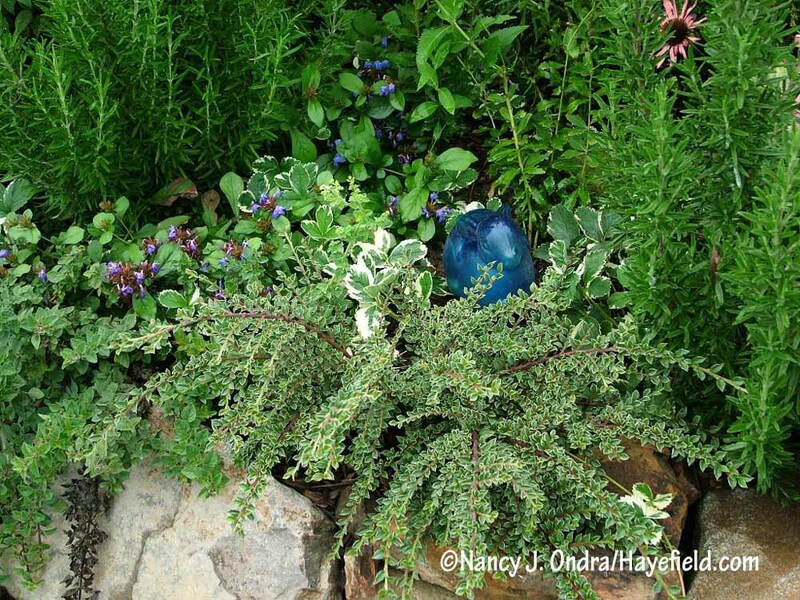 Another option is to use variegated plants as companions for equally colorful partners. 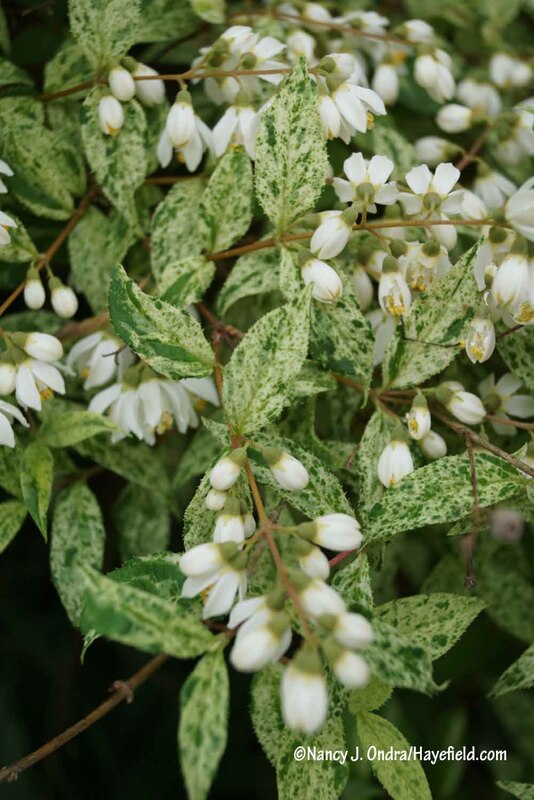 Create sophisticated effects by matching the colors of blooms or solid leaves with the markings of a variegate: white flowers with white-edged leaves, for example, or golden leaves with yellow-spotted foliage. 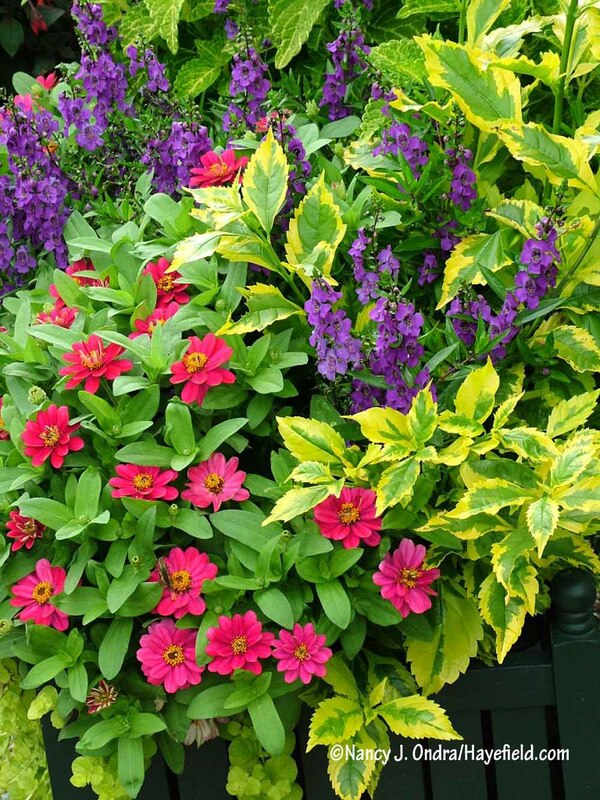 Or, use variegates to complement flowering or leafy companions in other colors: vivid variegation with intense or in-your-face flowers, and softer markings with pastel partners. 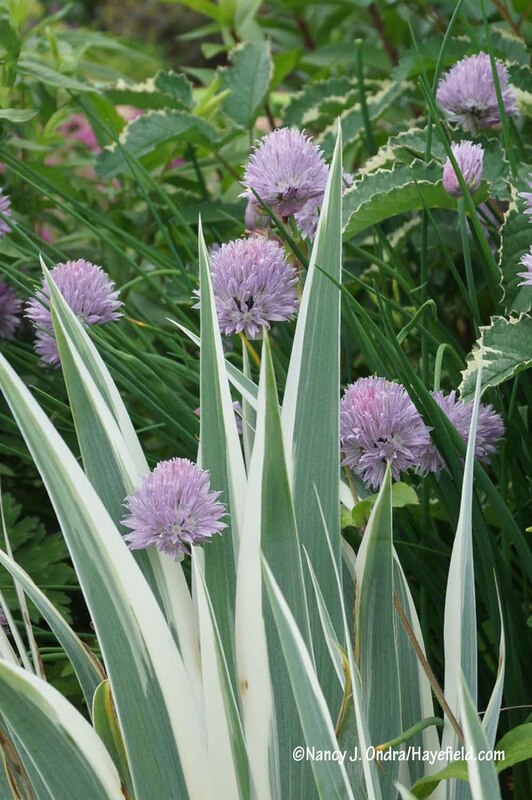 If you’re looking for combination inspiration, it can come from even a single variegated plant: just look to its flowers, fruits, or stems as well as its leaves. The pink tails of ‘Shiro-gane Nishiki’ kiss-me-over-the-garden-gate (Persicaria orientalis) are a pleasing match for its cream- to white-variegated leaves. 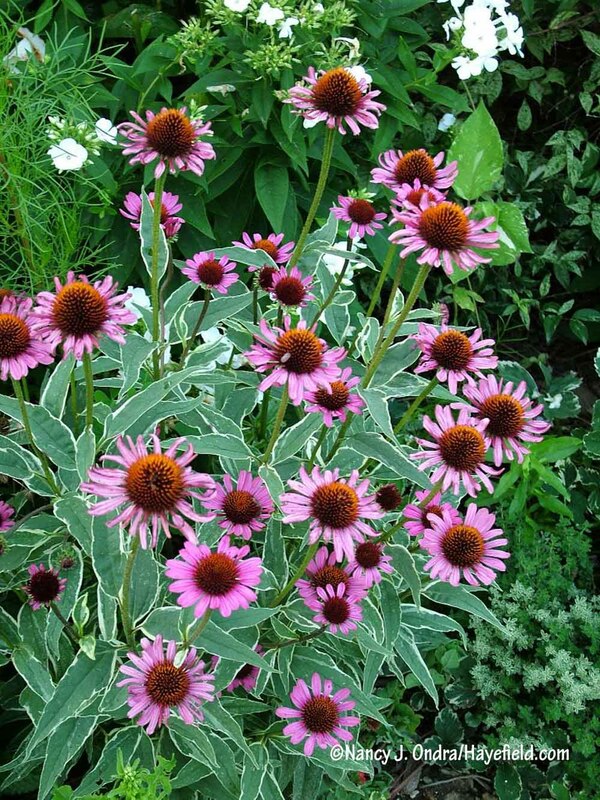 The fine ivory edge on the leaves of ‘Prairie Frost’ purple coneflower (Echinacea purpurea) adds an extra touch of charm to its pink blooms. 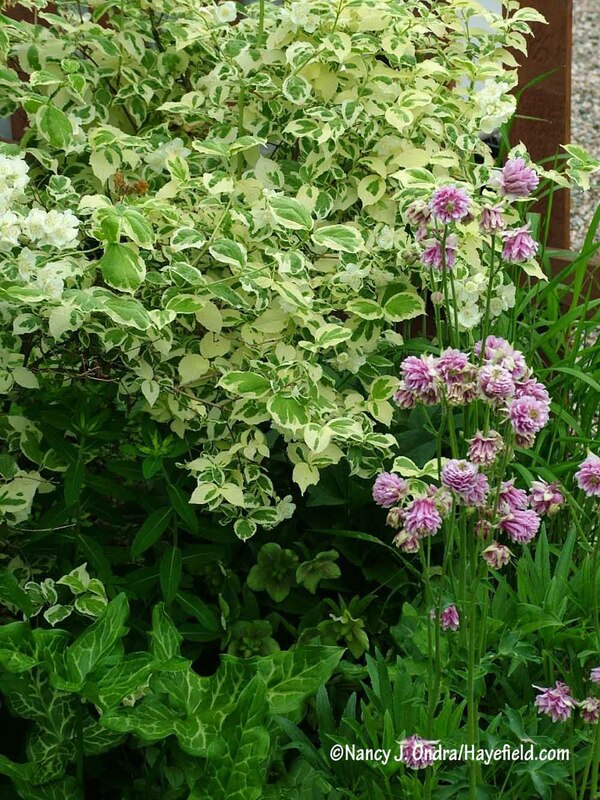 You can enjoy the same color pairing by choosing a separate pink-flowered partner, such as ‘Nora Barlow’ columbine (Aquilegia) with this variegated mock orange (Philadelphus coronarius ‘Variegatus’). 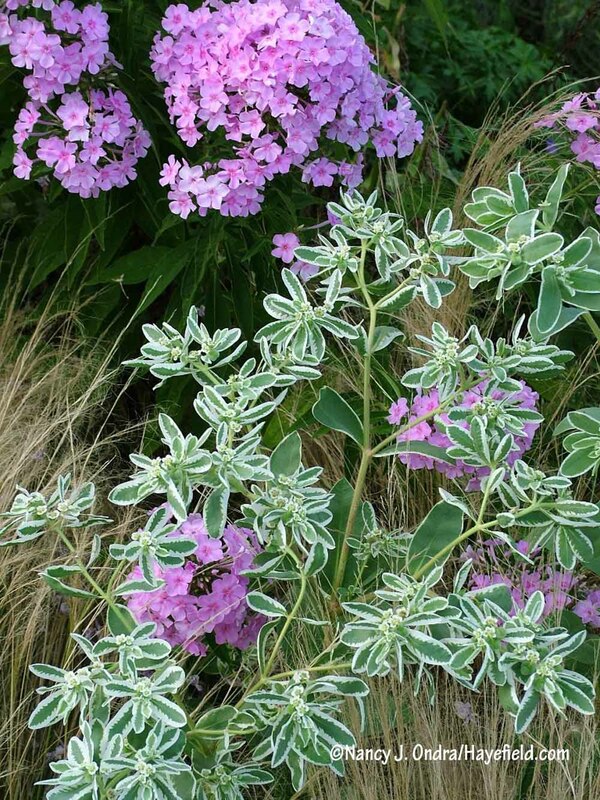 How about a pink garden phlox (Phlox paniculata) with snow-on-the-mountain (Euphorbia marginata)? I have to admit that I’m not crazy about red with white or cream, but a plant’s gonna do what a plant’s gonna do. 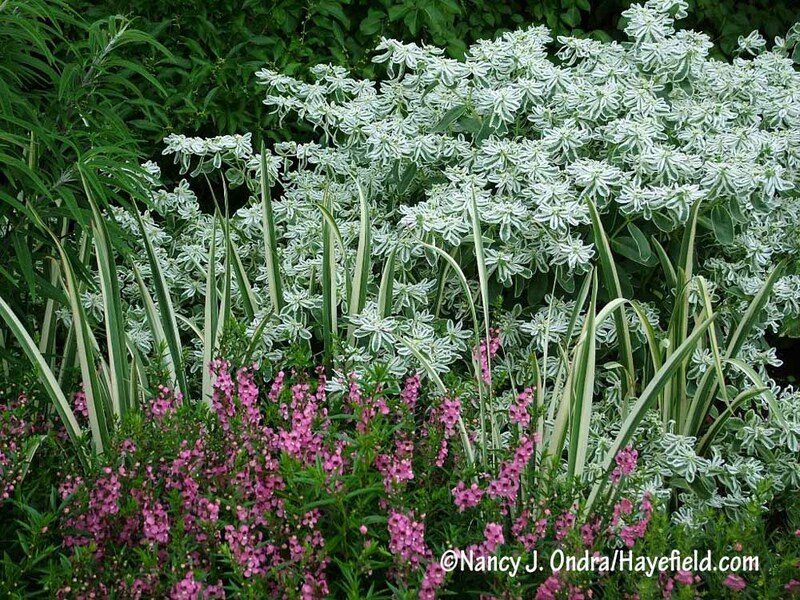 This is ‘Stars and Stripes’ starflower (Pentas lanceolata) paired with solid green curly parsley. 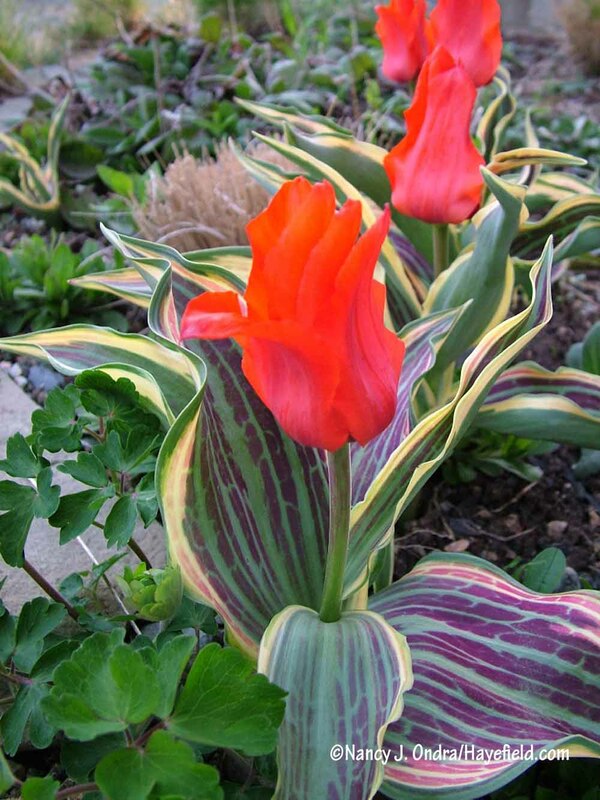 The scarlet blooms of ‘Fire of Love’ Greigii tulip are undeniably showy against its multicolored foliage. White with orange is another pairing I normally wouldn’t make on purpose, but some plants do it up right. 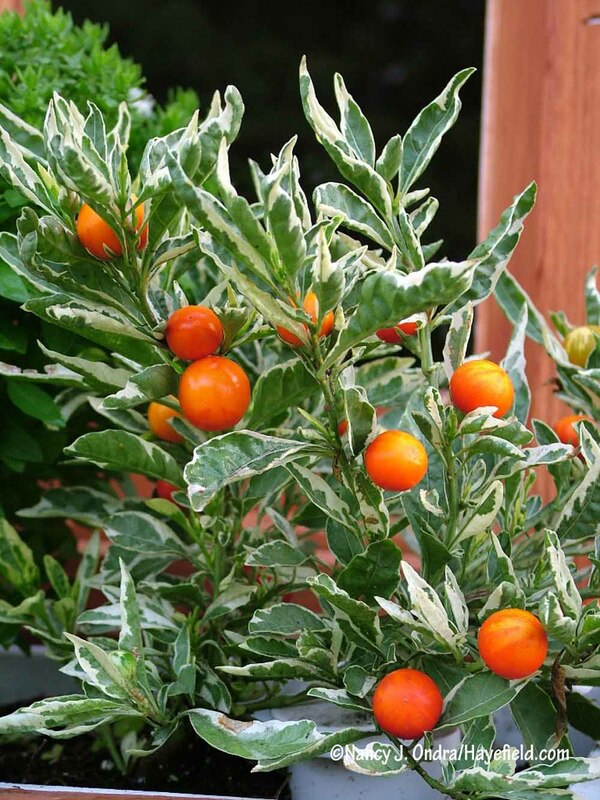 Here, the bright orange fruits of variegated false Jerusalem cherry (Solanum capsicastrum) stand out among the white-edged leaves. 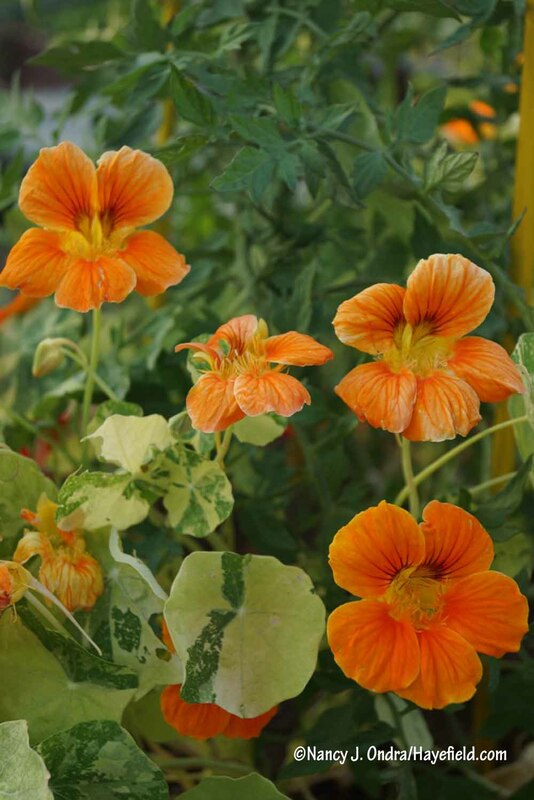 The slightly softer orange blooms of ‘Alaska Salmon’ nasturtium (Tropaeolum majus) pair nicely with its cream-splashed leaves. 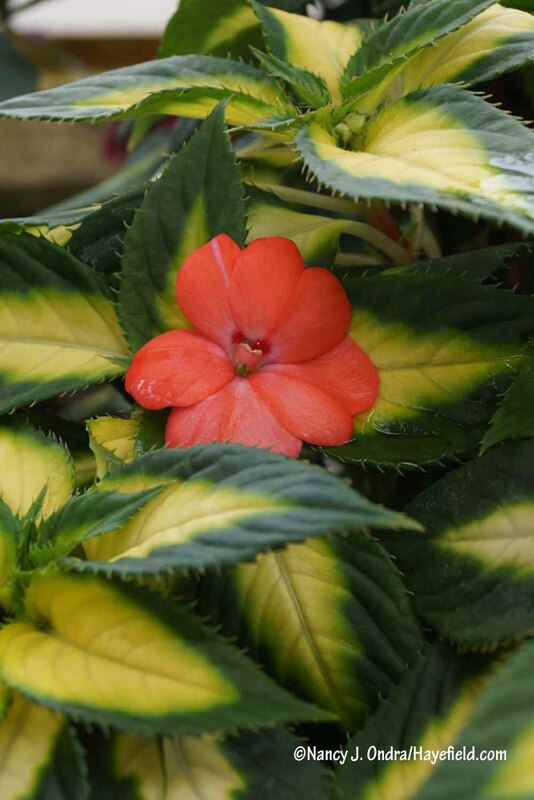 The orangey blossoms of ‘SunPatiens Variegated Spreading Salmon’ impatiens show off well against its yellow-and-green foliage. 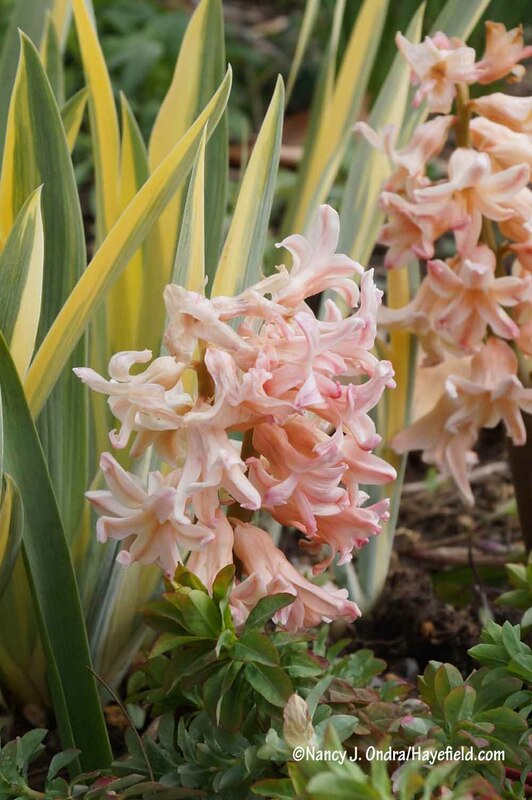 Pastel peach ‘Odysseus’ Dutch hyacinth is a good match for buttery yellows, like the striping on variegated sweet iris (Iris pallida ‘Variegata’). 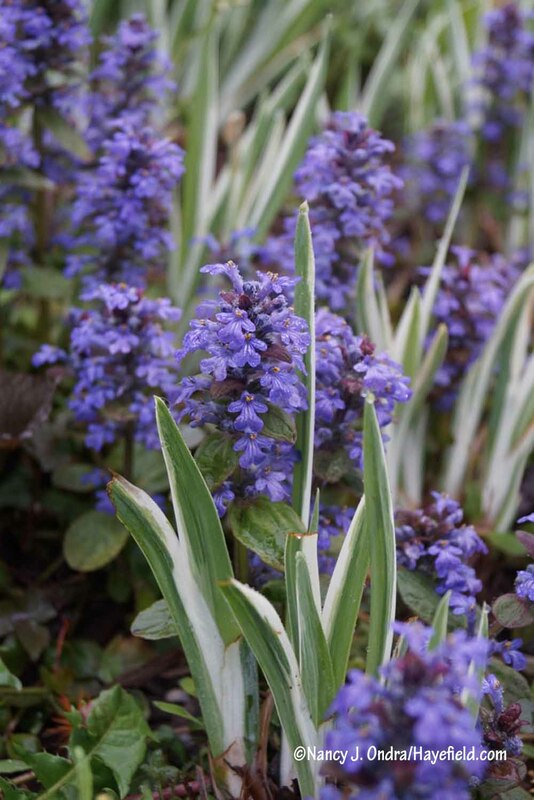 Blue and purple-blue flowers are beautiful against almost any sort of variegation. This ‘Hopley’s Variegated’ dayflower (Commelina communis) mostly looks pale green to yellow green unless you’re just a few inches away. 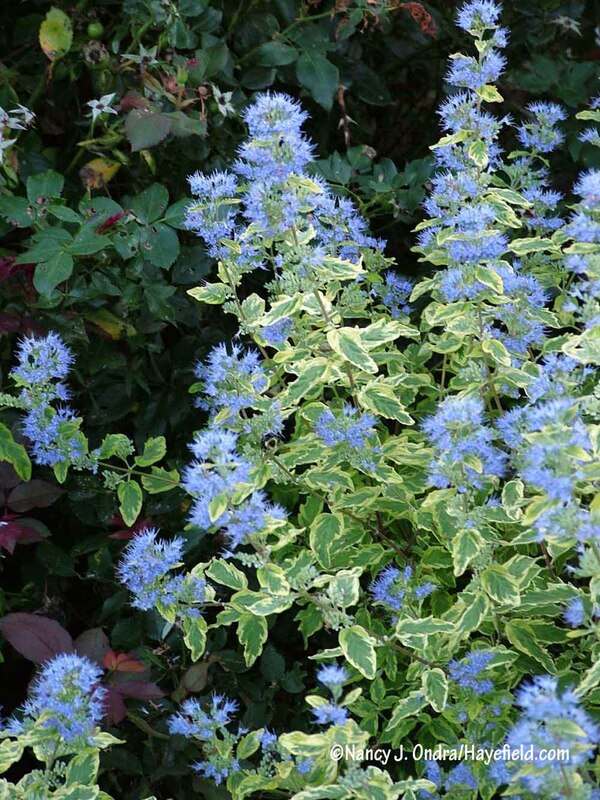 ‘Summer Sorbet’ blue mist shrub (Caryopteris x clandonensis) is lovely in leaf and even better in bloom, when its fluffy blue flowers complement the yellow-edged foliage. 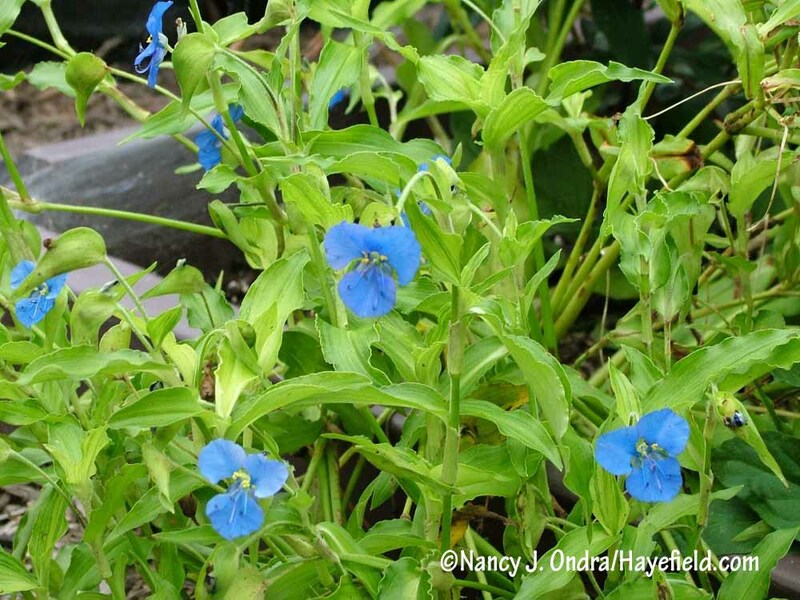 I’m particularly fond of pairing blue flowers with white-marked partners. 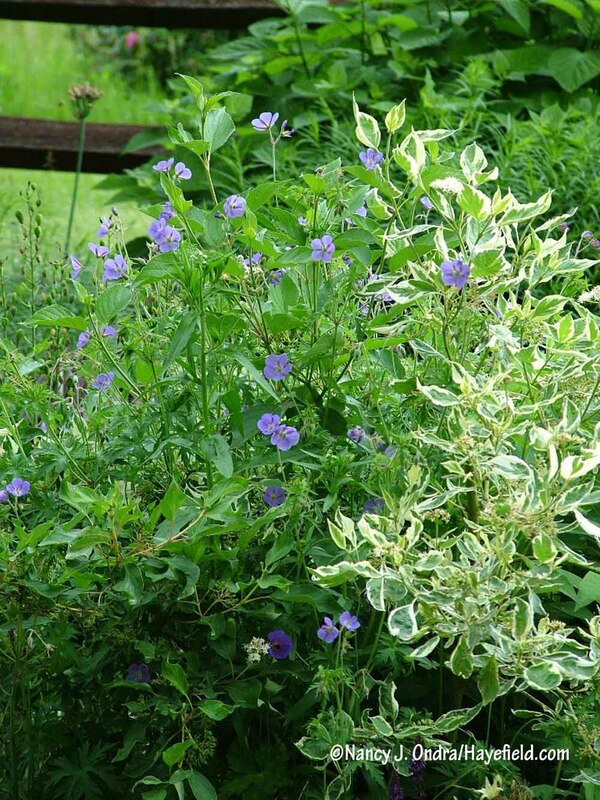 Here’s ‘Brookside’ hardy geranium (Geranium) winding up through a variegated red-twig dogwood (Cornus sericea). 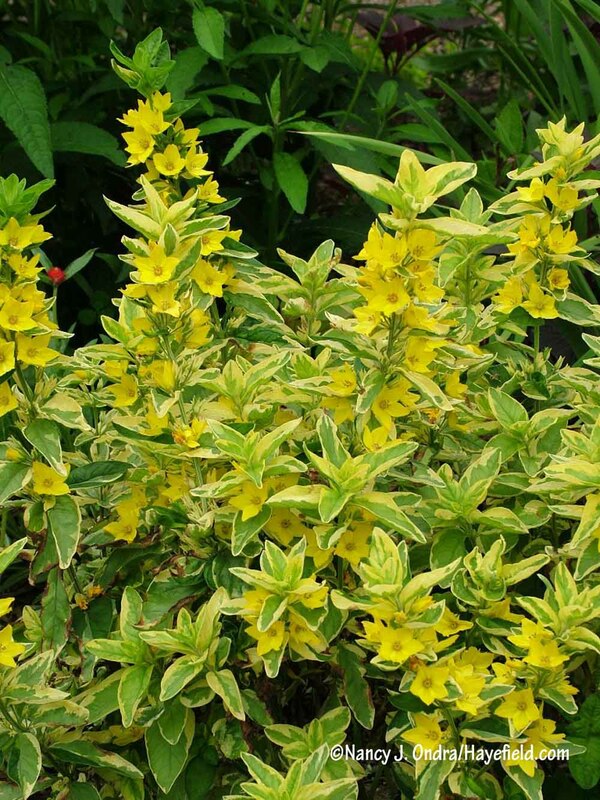 Though they’re plenty bright, the yellow blooms of Golden Alexander yellow loosestrife (Lysimachia punctata ‘Walgoldalex’) are hardly visible among the yellow-edged leaves. 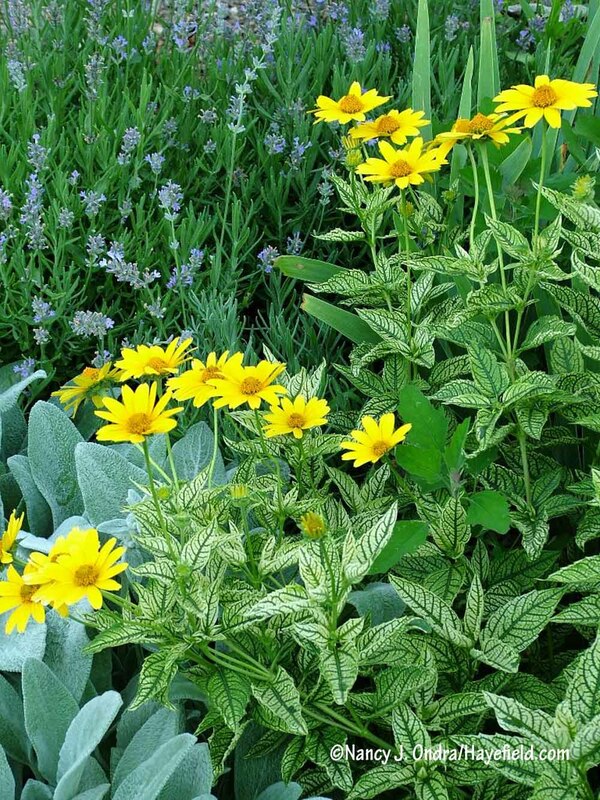 With the flowers and leaves on different plants, the yellows of ‘Full Moon’ coreopsis with ‘Axminster Gold’ Russian comfrey (Symphytum x uplandicum) each show to advantage. 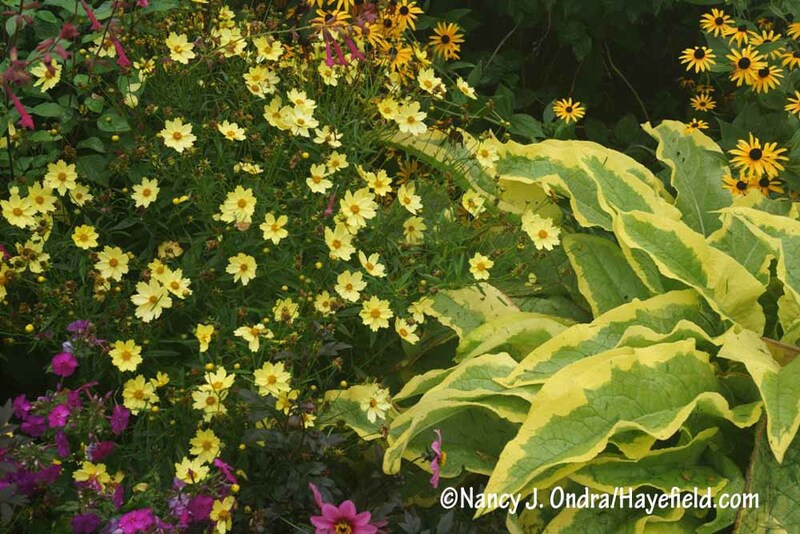 The brilliant yellow daisies of ‘Loraine Sunshine’ oxeye (Heliopsis helianthoides) are bold enough to show up against its white-variegated foliage. 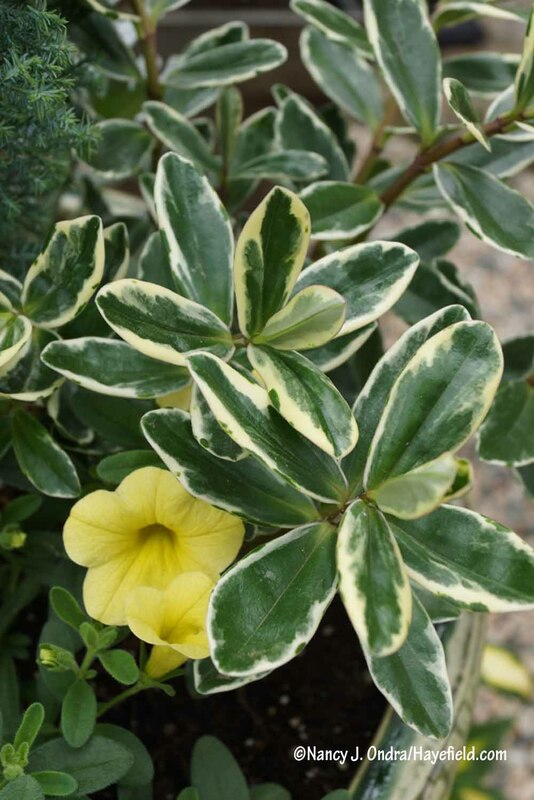 Soft yellow flowers, like those of ‘Bouquet Cream’ calibrachoa, pair prettily with cream to ivory markings, like those of variegated hebe (Hebe speciosa ‘Variegata’). 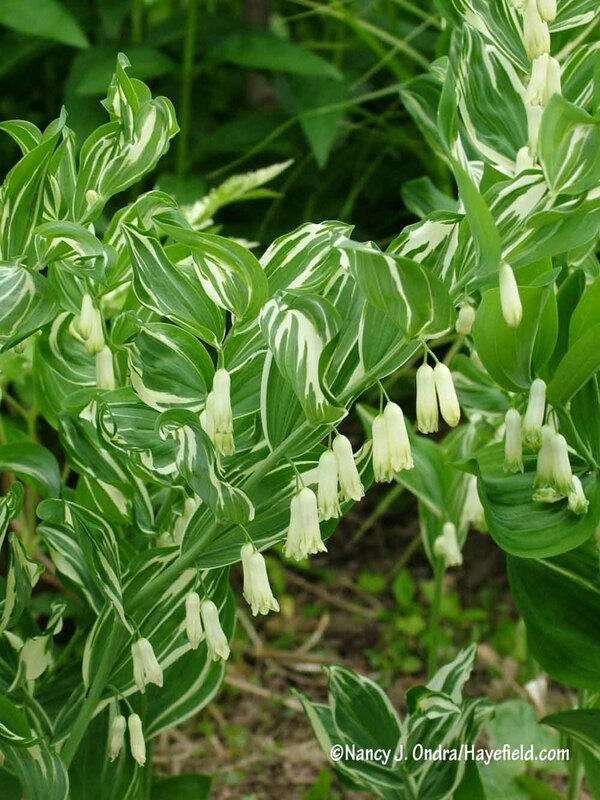 White flowers on white-variegated plants (as on Polygonatum x hybridum ‘Striatum’) are pretty much superfluous, unless you’re right up close. 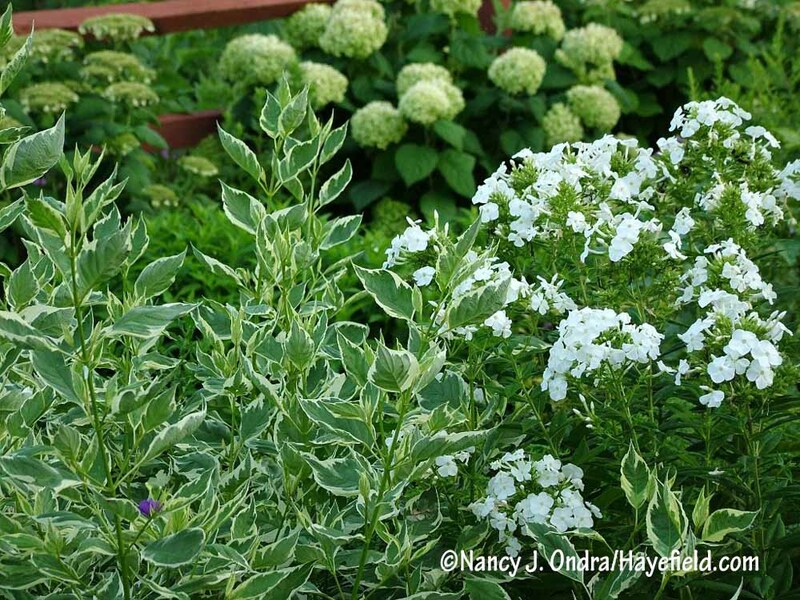 When white flowers and white-variegated leaves are on different plants, each tends to show off better. This duo shows a white hybrid hellebore (Helleborus x hybridus) with ‘Variegated Kwanso’ tawny daylily (Hemerocallis fulva). 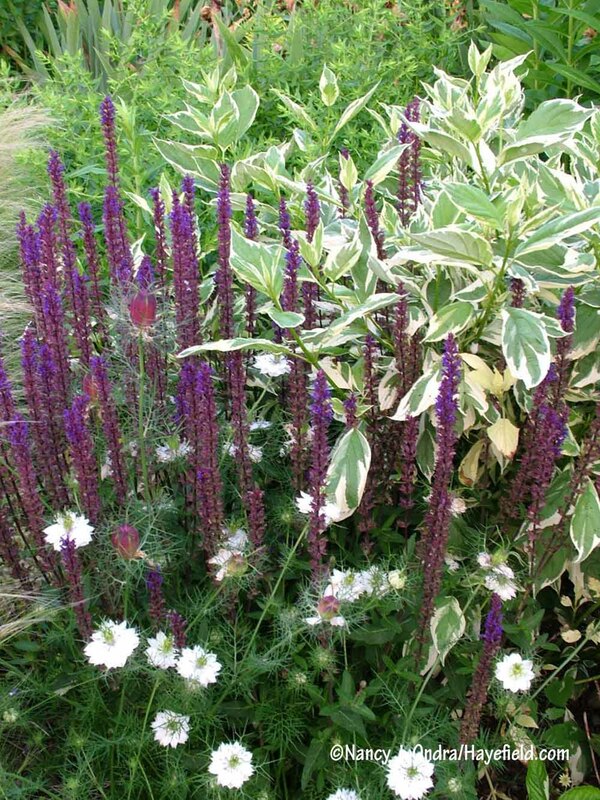 For something different, challenge yourself to combine two or more variegated plants. The trick is to get enough contrast in the leaf sizes or shapes; otherwise, the grouping will just look like a chaotic blob. Here’s a good example of a not-so-good combination: ‘Snow Fairy’ bluebeard (Caryopteris divaricata) with Mezoo Trailing Red aptenia (Dorotheanus bellidiformis ‘Mesbicla’). Though the bluebeard has a bit more variegation, the colors, patterns, and leaf shapes are too similar to provide enough contrast. 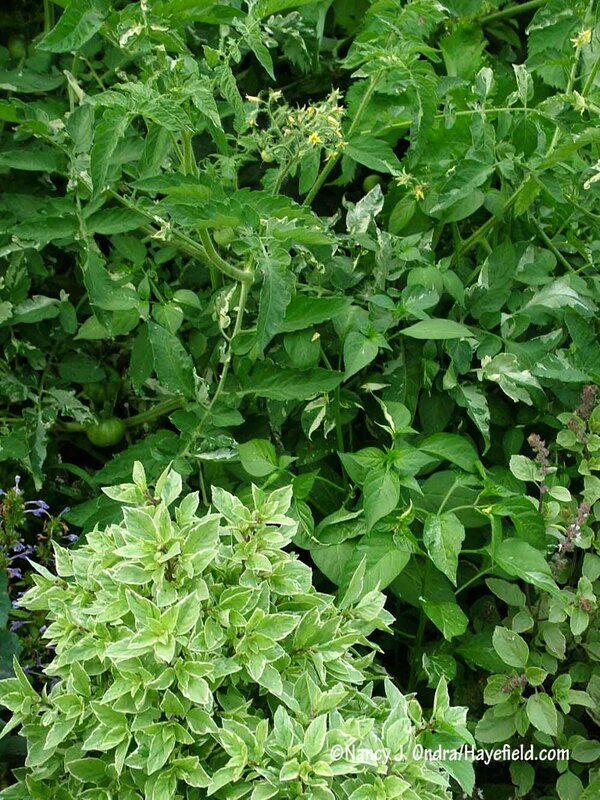 There are four variegated plants in this photo, but the only one that really stands out is the ‘Pesto Perpetuo’ basil in the lower left. You have to look closely to appreciate the variegated tomato at the top (‘Variegata’, also known as ‘Splash of Cream’), the ‘Fish’ pepper in the lower middle, or the ‘Variegated African Blue’ basil in the bottom right corner. A pairing of equally bold variegates: variegated sweet iris (Iris pallida ‘Variegata’) with ‘Axminster Gold’ Russian comfrey (Symphytum x uplandicum). Their colors are very similar, but the heights and textures are different enough that I think the combo works–especially if you see it from this angle, so they don’t overlap. 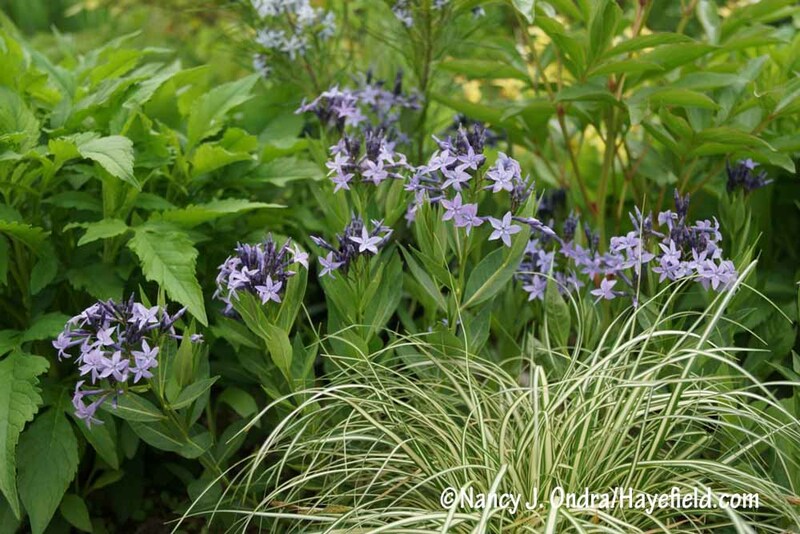 This container combination of variegated Tasmanian flax lily (Dianella tasmanica ‘Variegata’) and ‘Burgundy Glow’ ajuga (Ajuga reptans), with a bit of ‘Harlequin’ wintercreeper (Euonymus fortunei) at the back, is all pretty similar color-wise, but the distinctly different leaf shapes add just enough contrast. 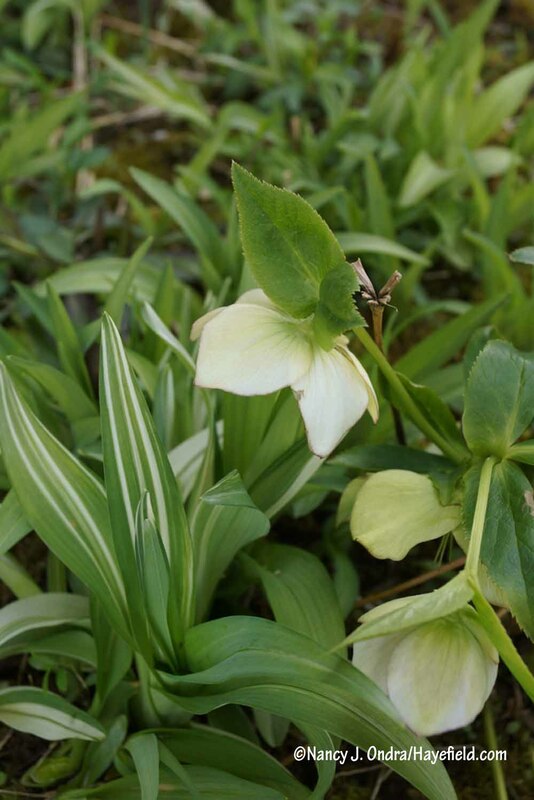 Another variegated pairing–‘Snow Cap’ sedge (Carex siderosticha) and variegated Solomon’s seal (Polygonatum odoratum ‘Variegatum’)–with similar colors but sufficiently different intensities and leaf shapes. 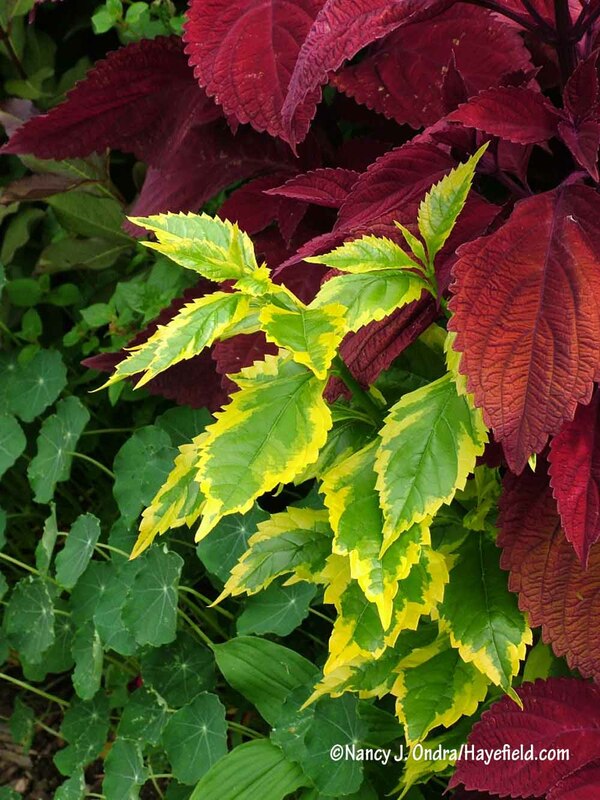 Adding a solid-colored plant to a variegated pairing can be enough to balance the bold markings. 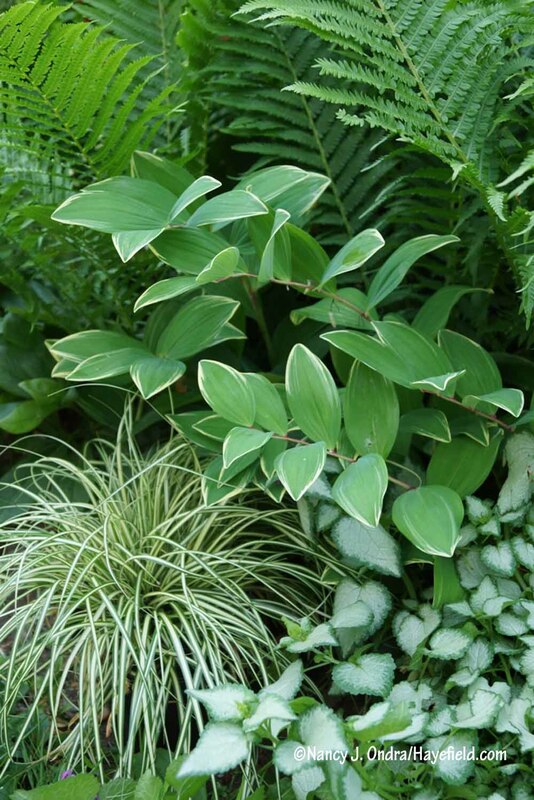 This trio features white-variegated sweet iris (Iris pallida ‘Argentea Variegata’) and ‘Frosty Pearl’ euonymus (Euonymus fortunei) with European wild ginger (Asarum europaeum). 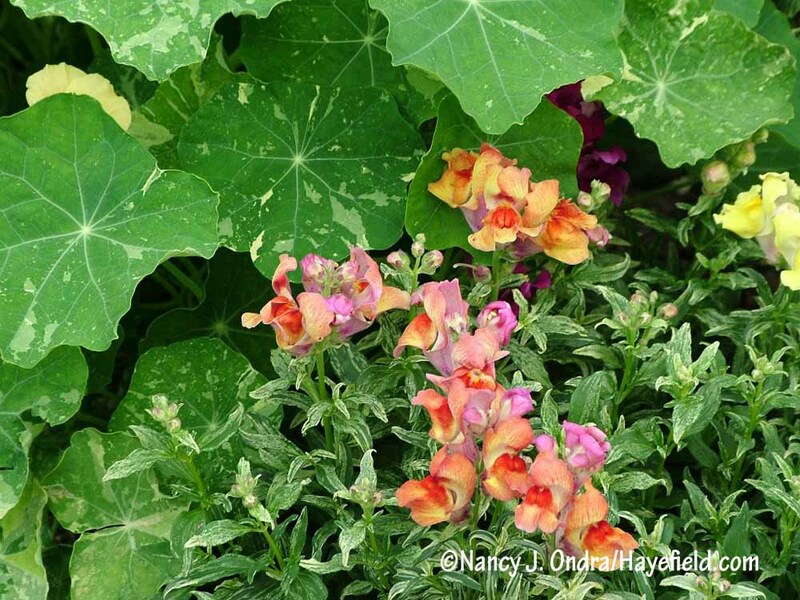 Showy flowers can also help to balance equally eye-catching foliage, as in this pairing of ‘Frosted Flames’ dwarf snapdragon (Antirrhinum majus) and ‘Alaska’ nasturtium (Tropaeolum majus). 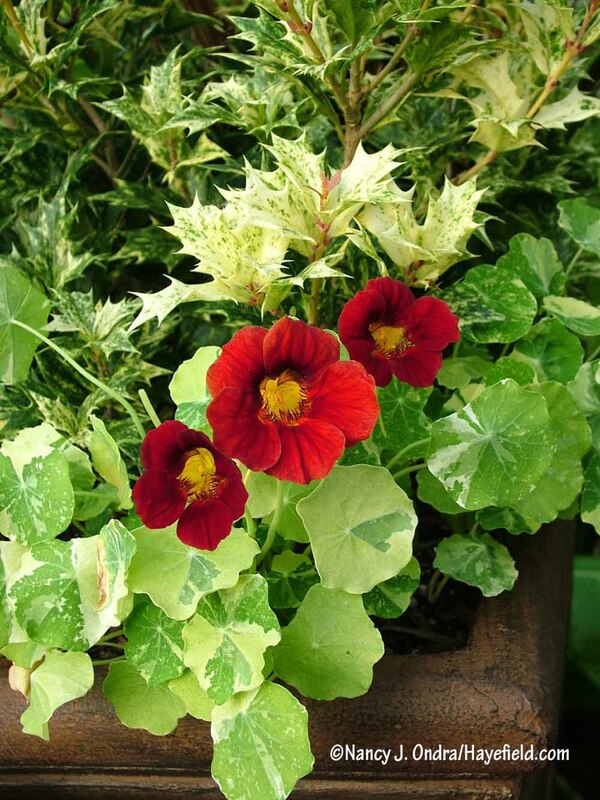 In this variegated pairing of ‘Alaska’ nasturtium (Tropaeolum majus) with ‘Goshiki’ false holly (Osmanthus heterophyllus), the nasturtium’s flowers are the star. The pink spikes of angelonia add some much-needed color to this pairing of variegated Japanese iris (Iris ensata ‘Variegata’) and snow-on-the-mountain (Euphorbia marginata). Well, that was an enjoyable foray into color on an otherwise very white day here in PA. Here’s hoping that you’re enjoying a “normal” spring wherever you are, and that we all have flowers to enjoy by April’s Bloom Day. Aw, poor little alpaca. How sad that he doesn’t have a cozy barn with soft bedding and plenty of snacks and warm water. Oh, wait…he does. Hmmph. Who cares about flowers? I just want my green grass back! Welcome, Sharon! It’s a pleasure to meet you. We had our spring already, then a late winter; who knows what’s next? I do hope that you get some good weather soon for your garden projects! 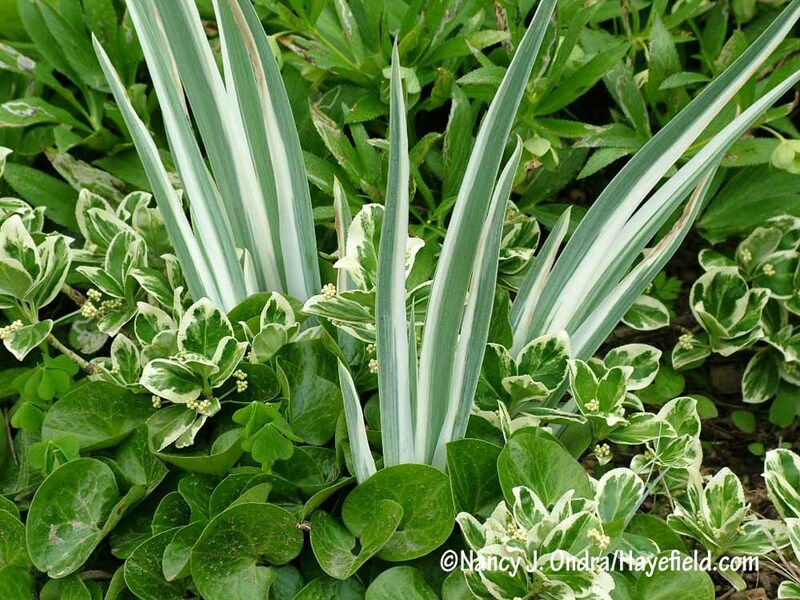 May I reprint your observations on variegated plantings (with due attribution) in a magazine which I produce for the Variegated Plant Group of the British Hardy Plant Society. I’m honored that you asked, Ian. I’ll be in touch with you by email a little later today. So glad your blog is back. I’ve missed it. Hope your weather improves, as we are finally having a springtime in England (that could change, of course). I have a new garden and am looking for climber and perennial ideas, and yours is my natural choice as I love the way it looks and your helpful comments. 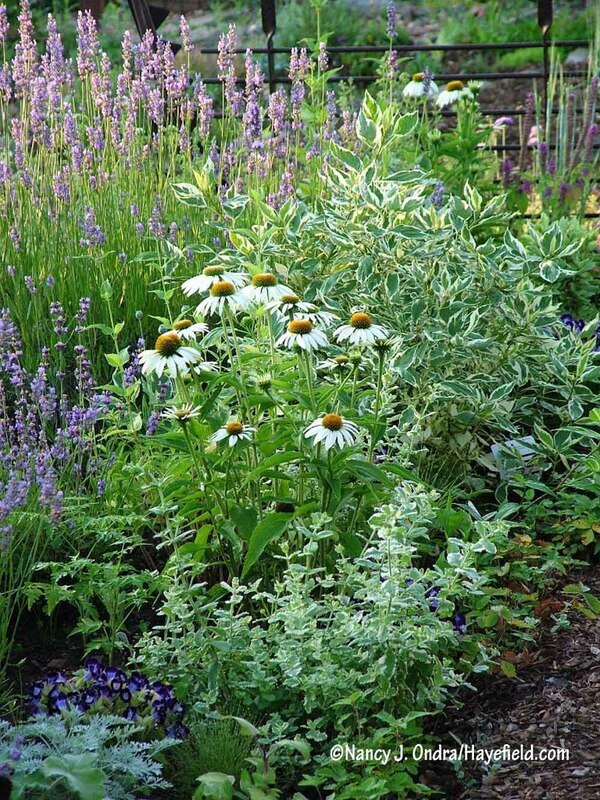 I especially study plantings you think don’t work, as they can be the most informative. Good morning, Cathy. With spring officially arriving in just a few days, we can all look forward to milder weather–eventually. It’s so nice to hear that you enjoy the blog. I had lots more photos of not-so-good combinations but figured I was already trying readers’ patience with the long post. 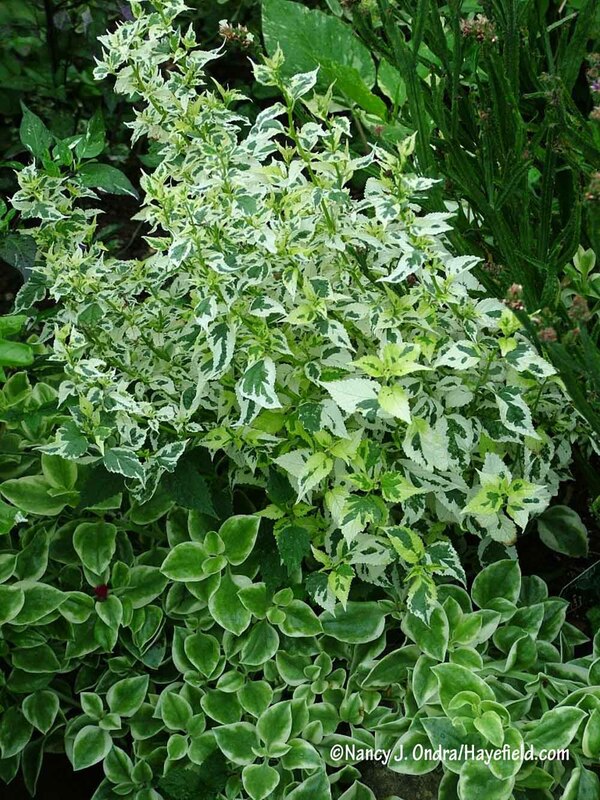 To be honest, I like variegates so much that I can appreciate them in pretty much any combination, but I try to be a bit more objective in assessing whether or not a given pairing would work in a “normal” garden. I have only very recently come across your blog and wanted to say I really enjoyed reading through your posts! I live in London, UK, and only have a small rented garden so alot of my plants are kept in pots to take with me when I move- but have planted out a whole range of pollinator friendly plants to encourage biodiversity. 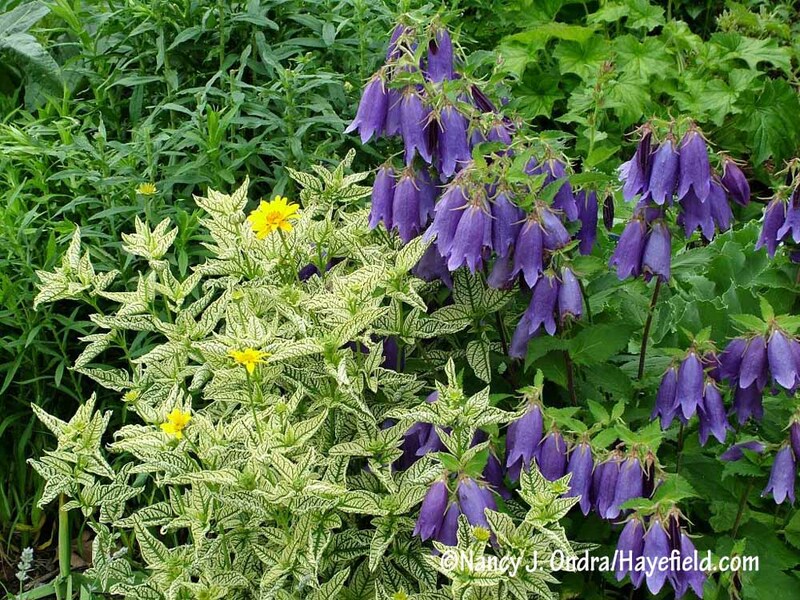 Your Axminster Gold Comfrey and Jade Frost Eryngium look beautiful and would be great to add to attract the bees! Many thanks for posting your blog! Greetings, Owen! It’s great to have you as a reader. Best wishes for finding your dream garden soon; it sounds like you already have a good start with your collection of potted favorites. Sure you aren’t tempted by the variegated dandelion too, for the early pollinators? 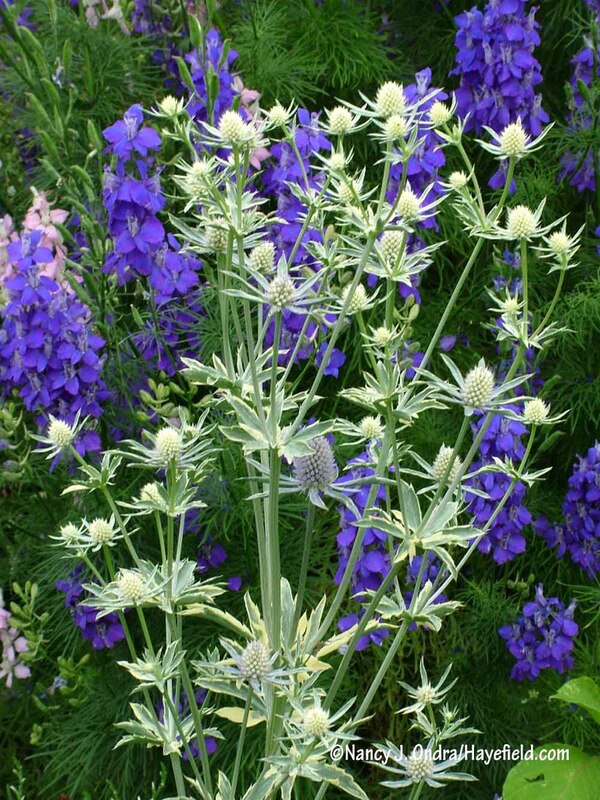 It’s available from Plant World Seeds in the U.K.; now sold as ‘White Flash’, I see, though the markings are yellow. I must admit, I had trouble keeping it going–the same as with the red-leaved dandelion, and the pink-flowered one they offer–so maybe you’d want to save that for once you get settled in. 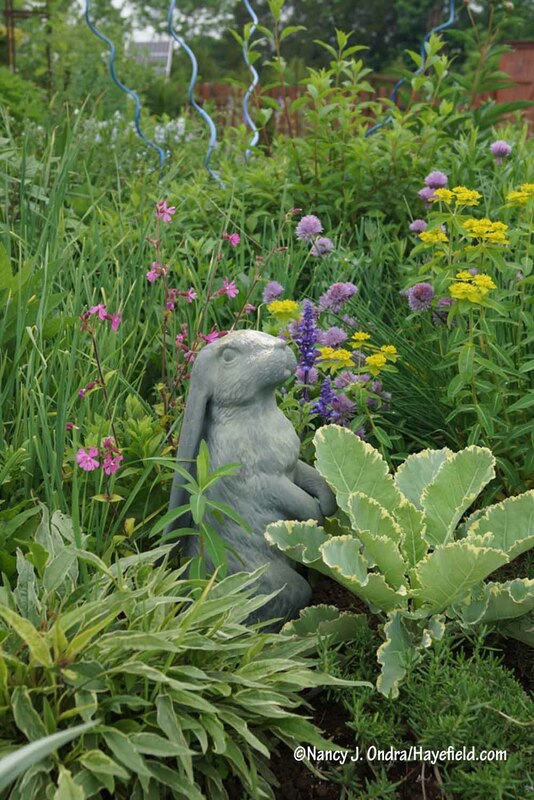 Great to see a post from you this morning, I’ve missed your garden almost as much as my own (which is now under 20″ of snow here in the Hudson Valley!) 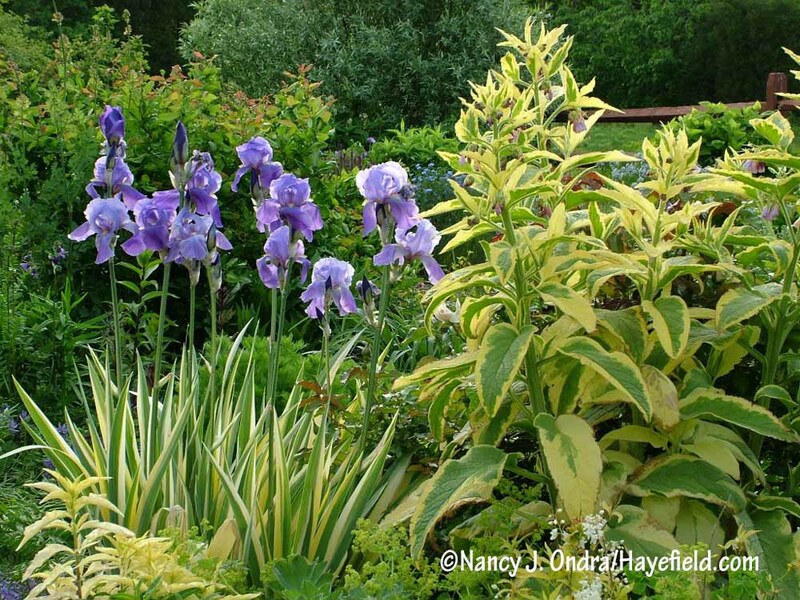 Great inspiration as always, and I was pleased to see you feature one of my favorite combinations: Iris pallida ‘Variegata’ with ‘Axminster Gold’ Symphytum. Always works well together in my sunny and dry raised bed, and an astute gardening friend pointed out that the Comfrey is particularly valuable because there aren’t very many bold-textured plants with such vibrant variegation for full sun… most similarly marked plants would be shade lovers, like Hostas. Good point that hadn’t occurred to me! That IS a good point, Robert! Interesting that it works in sunny and dry for you. Here in southeastern PA, I find it scorches in full sun unless the soil is on the moist side. Sorry to hear that you have so much snow. We ended up with about 7 inches of sleet topped by another inch or two of snow. Shoveling that much sleet is a life experience I never want to repeat. Spring cannot arrive (or rather, return) too soon for me. Hi Nan, thanks for the very interesting post. 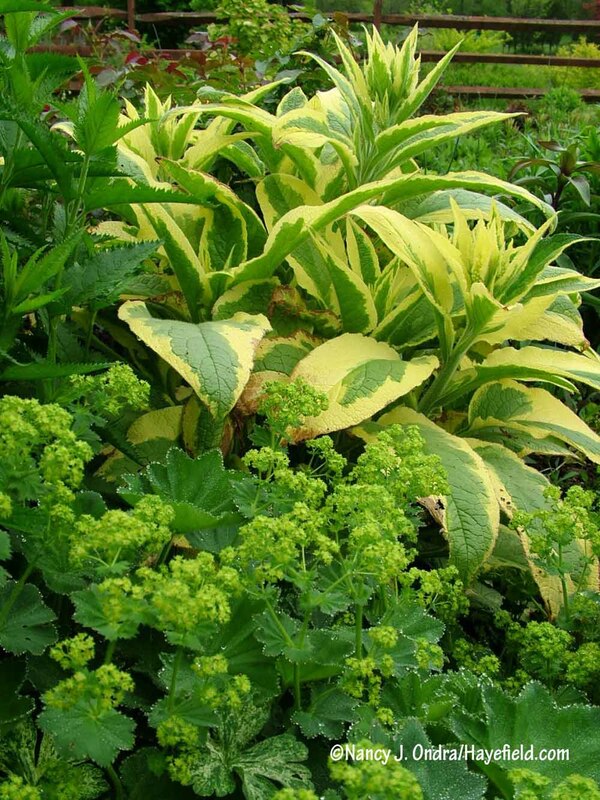 I love variegated plants, though only gold/yellow/green variegation, (Can’t get hold of the Axminster Gold Comfrey) As always I love your plant combinations. Spring has arrived here in NW England, though unfortunately I’m laid up in bed with a bad cold/sore throat. Your post cheered me up no end, as soon as I am well again, I will be back in my garden, as I hope you will be in yours, when you get better weather. 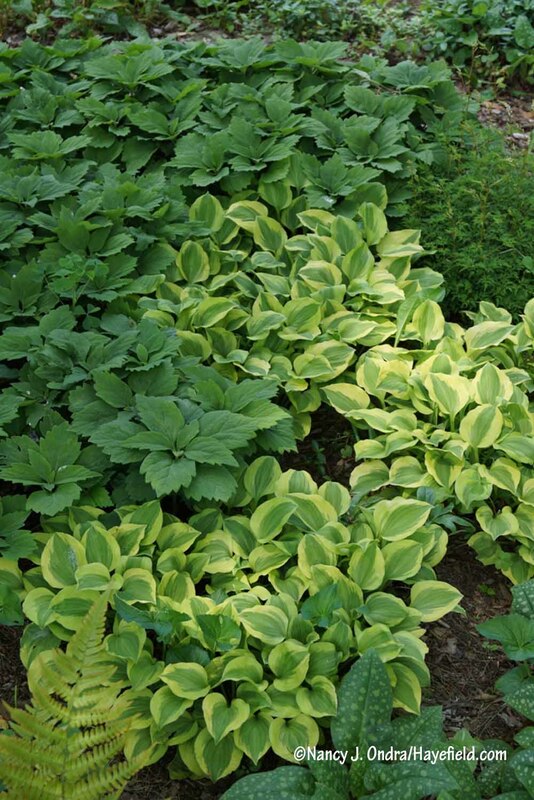 I can’t remember if I knew that, Allan–that you like only gold/yellow/green variegation. It’s funny how people tend to have strong feelings about variegation colors and patterns. I send you good wishes for a speedy recovery so you can get back to your beloved garden quickly! Very, very nice post. You have such amazing pairings. I so appreciate your detailed explanation of variegated plant visual dynamics. Thanks. I’m so happy to hear that you enjoyed the post, Luke. It could easily have been twice as long. Maybe I’ll do a follow-up at some point. Have a good spring, whenever it shows up! What an inspirational post. I am sitting here in the house looking outside wishing it was a normal spring. Crazy weathers. When I see that lovely lamium that grows almost anyplace except my garden I wither in defeat. I don’t know why when I try to grow it it does well for a couple of years and when I expect it to leap it dies.??? I am glad there are many more choices out there but you know you always want what you can’t grow. I hope your area thaws out soon. Cheers. I have exactly the same experience, Lisa: the spotted lamium does beautifully for two or three years, then fizzles out. Oh well; at least we don’t have to worry about it becoming a thug, right? Here’s hoping we can all enjoy a colorful April Bloom Day! Good morning, Emilita! I don’t get out much, so I’m not too familiar with gardens to visit in that area, other than the U.S. Botanic Garden and the Smithsonian Gardens. Readers, do you have any other suggestions for Emilita? Green Spring Gardens Park just outside of Washington (in the suburbs) is also quite extraordinary, located in Alexandria VA, part of the Fairfax County Park System. We also have the US National Arboretum in Wash. DC. Dumbarton Oaks in Wash. DC, is an old historic garden, very beautifully done, with incredible architectural elements, and trees trained into architectural elements, with natural and tiled pools. The kind of garden created when people had lots of money, yet very beautiful. Mount Vernon is within striking distance of DC for a nice daytrip and would be interesting for someone from outside the states to see what an 18th century American garden was like. Beautiful site, large kitchen garden, magnolia hedges, ha-ha, garden outbuildings, plus of course it’s the home of our first president, so the house is fascinating too. I was hoping Bloom Day would appear to chase away the winter chill, and you didn’t disappoint, magician that you are, pulling beauty and color like scarves out of a hat (archives)! No shamrocks?? That’s all right–I do believe I could see forty shades of green in those photos. Hey, happy almost-spring to you! No shamrocks, but how about a variegated red clover I found on a roadside near here? 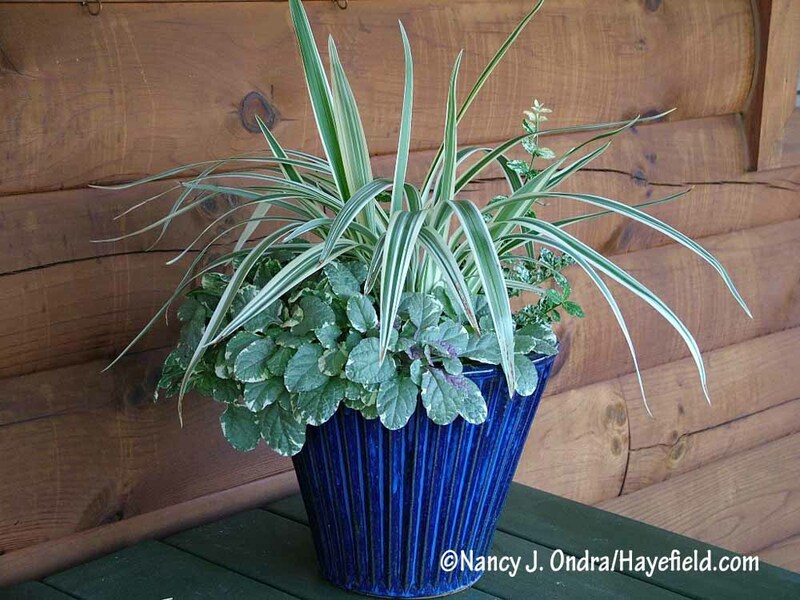 You handle variegated foliage beautifully, Nan – not that that’s remotely surprising. I admit to loving variegation myself and, if anything, have over-used it in some cases, something I’m slowly working to correct. MANY of the most interesting succulents are variegated specimens but those too benefit from contrast with non-variegated companions so I’ve been diversifying my plant selections to take that into account. The ‘Spider’s Web’ Fatsia is possibly the only variegated plant I haven’t been able to warm up to, although I did see one (only one!) 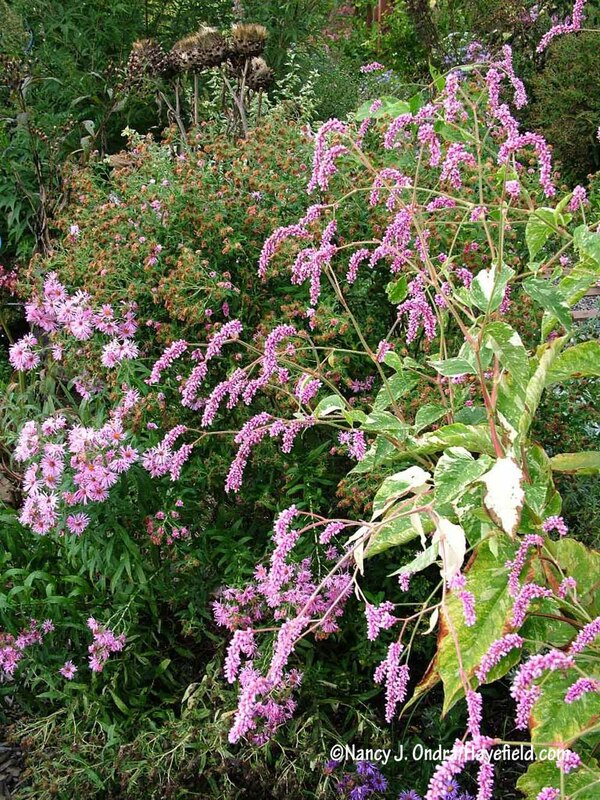 photo of the plant in a blog on-line that featured an attractive specimen. I hope the blizzard in the NE moves on quickly and your temperatures warm. You and “the boys” deserve a healthy dose of green after all that white. Thank you for stopping by, and for your warm thoughts, Kris. It’s still cold and windy here, but we’re finally getting some sun and a bit of melting. 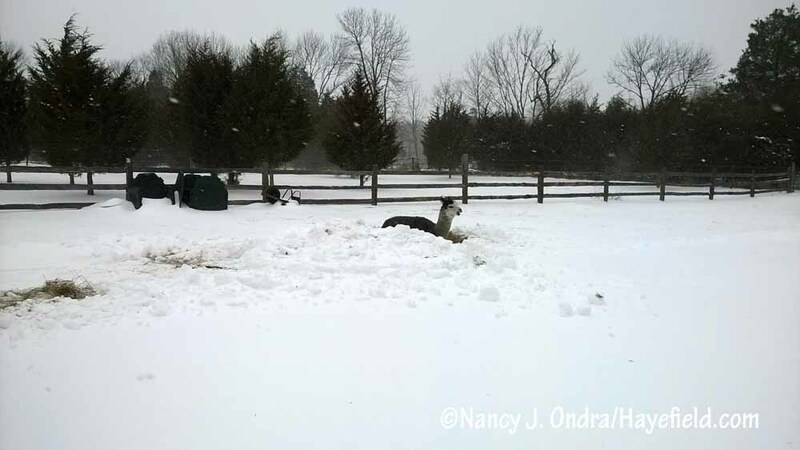 Duncan will be very glad to be able to move around freely again; right now, he’s stuck using whatever paths I can shovel for him. And I am looking forward to getting back into the garden! Such a thoughtful and informative article, Nan. You’ve really put into words a lot of effects that we intuitively experience. Some great combinations. For my tastes, I’ve always that that Fatsia ‘Spider’s Web’ really should be called ‘Spider Mites’; that’s all I see when I look at photos, although I’ve never seen it in person. Hah – you too? I did see a gorgeous ‘Spider’s Web’ in a greenhouse once, but not since then. I know some people dislike virus-like variegation, as well. 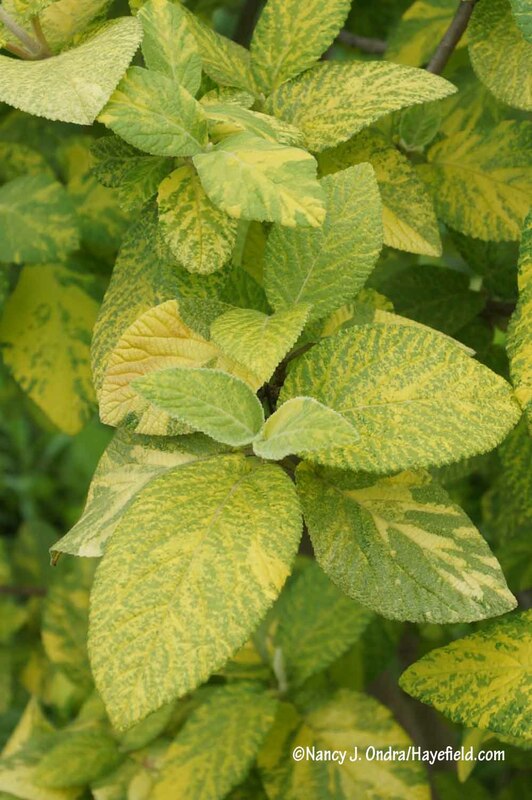 The markings on that variegated wayfaringtree (Viburnum lantana ‘Variegata’) look rather like a mosaic virus pattern, for example, so it probably wouldn’t appeal to everyone. I just received your posting, and find it very informative. I liked it so much, I’m going to check out your books. I love your natural look, and plant combinations. 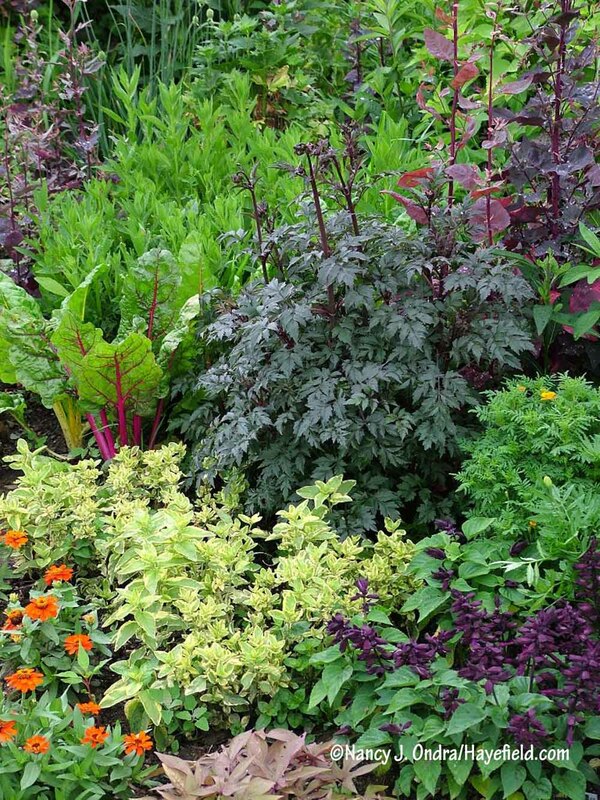 Judging by the size of the plants, your soil must be well-nourished. I am waiting to see the damage of the cold snap, 2 nights of 22 degrees after the warm early spring will be a set back. The last time this happened in our Zone 7, I lost 10 Japanese Maples. Oh no, Judy…I hadn’t even thought of damage to the trees. I hope yours come back all right! Thank you for saying that you enjoyed the post. 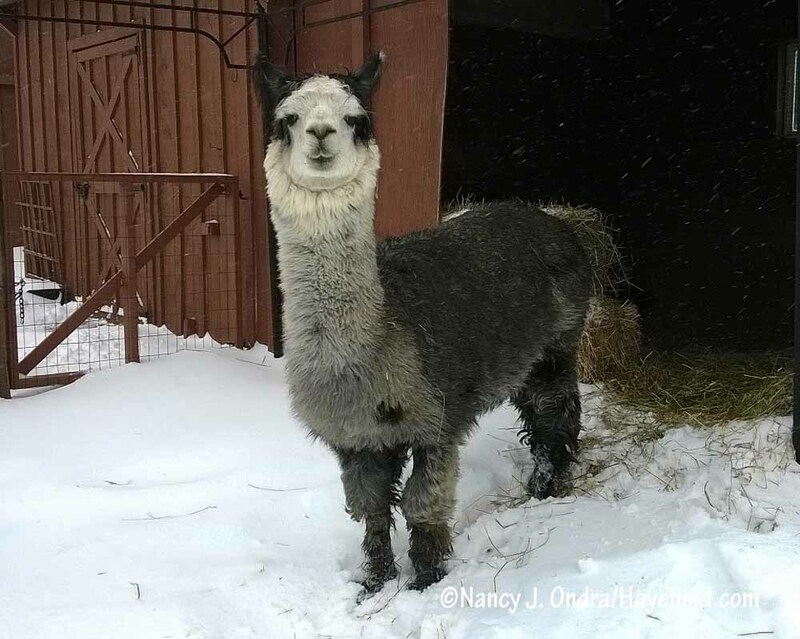 Yes, alpaca manure does wonderful things for soil and plants. I will have to try ‘Axminster Gold’ comfrey again. 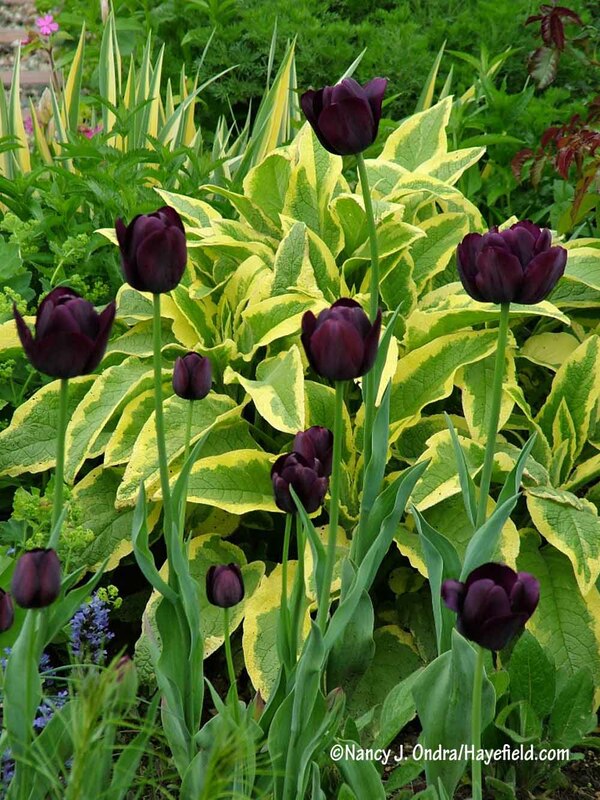 I just loved every plant combination you showed that featured it, but most especially with the ‘Queen of the Knight’ tulips. 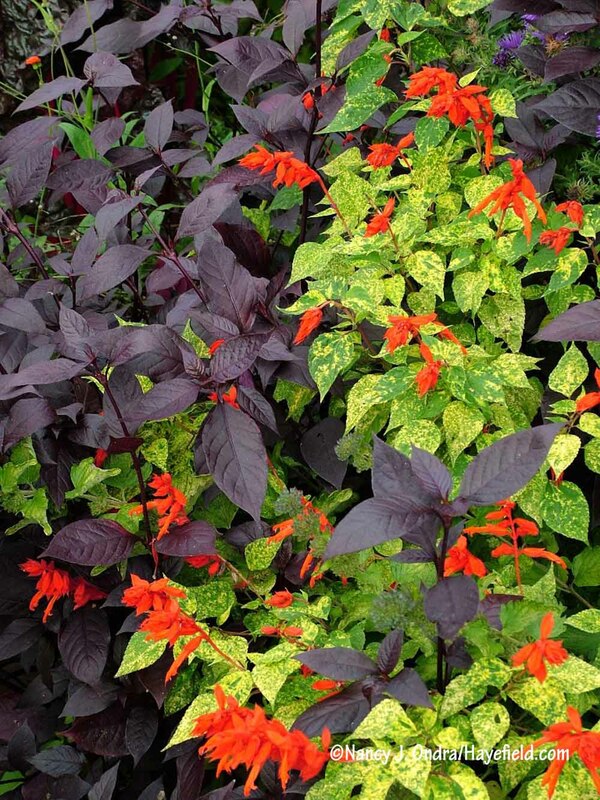 I also really liked the ‘Dancing Flames’ scarlet sage with the ‘Purple Knight’ alternanthera. March has been quite a trial thus far, but I believe the sub-zero weather we had earlier in the month was harder on my plants than the current 3 ft. of snow, although I now despair of seeing them again until April! It’s going to take a while to melt all this snow!! Oh, Kathy – 3 feet?! That’s brutal; I’m so sorry. I guess you’re stuck with garden planning for a while longer. If you decide you can’t live without ‘Axminster Gold’, I see that as of today (3/16/17), Avant Gardens has it available on their website: Symphytum ‘Axminster Gold’. What always strikes me about your posts is how meticulously you must archive all of your photos to be able to pull together such informative and detailed posts. 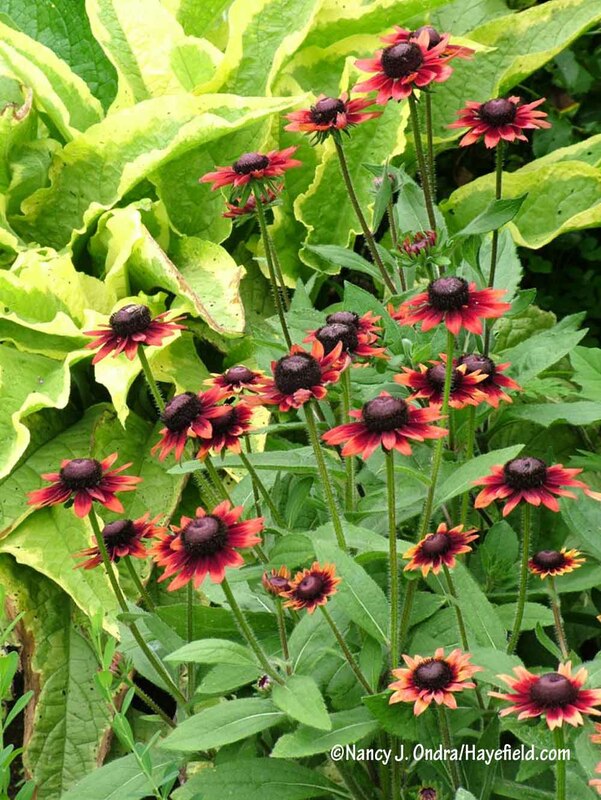 Truly beautiful plant combinations, photographs, and such useful observations about design. Thank you! Trust a fellow blogger to think of that. It does indeed take a good deal of time to tag the photos for archiving; then there’s the time involved in pulling images for a post, whittling them down, watermarking and resizing them, uploading them, placing them, and adding captions. It’s worth it, though! I really appreciate your comments, Mary. Nan, great post! I adore variegation, especially the yellow on green type… thanks for pointing out the importance of leaf sizes and shapes as well as the coloration. 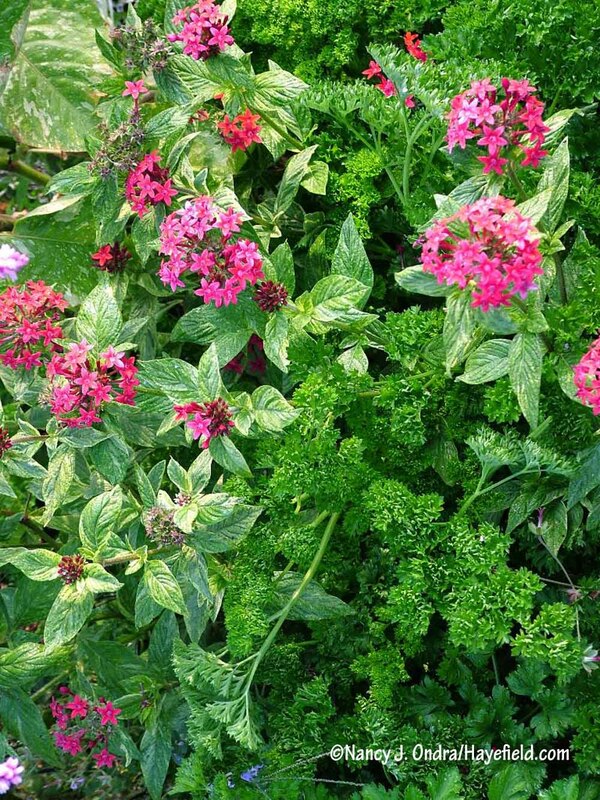 Can you recommend a source for the variegated comfrey? One thing, do I surmise you now only have one alpaca? What happened to Daniel? Or am I mistaken? I always look forward to seeing them in your posts. Hi Kate! 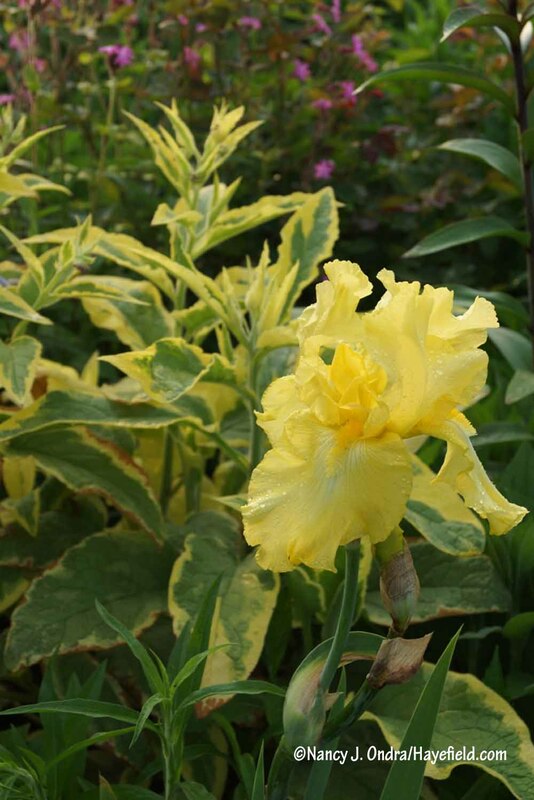 Avant Gardens has ‘Axminster Gold’ at the moment. I put a link in my response to Kathy’s comment. And yeah, we lost Daniel about a month ago. He hadn’t been well since last spring, actually, so I knew it was coming, but I still miss him. It was hard on Duncan at first, losing his brother and lifelong buddy, but he seems to be doing well now. So sorry for your loss Nan. Thank you, Kate, from both of us. I saw your post late last night. I wanted to be among the first to tell you how much I missed you. However, I thought it better to carefully absorb your wonderful post before replying. You haven’t missed a beat. I also enjoy reading people’s comments and your responses. However, your response about Daniel was heartbreaking. I’m sorry for your loss. My heart goes out to you. Thank you, John. It’s always good to hear from you. Our best to you and yours. I LOVE that plant combo in your first photo. I’m sorry about your weather. Doesn’t seem fair after that spring-like weather, does it? So sorry about Daniel and I feel for Duncan, too. That’s a favorite of mine too, Jean. Our weather does seem to be improving; at least we’re above freezing today. And thanks about mentioning Daniel. Duncan has adapted surprisingly well to being an only child. I was fully prepared–well, not prepared, but expecting–that I might end up losing him as well. Argh, how disappointing that your garden-building was interrupted, but maybe it’s good that you’ve gotten a little break so you can rest up for the next round. May you enjoy some marvelous melting very soon! Fantastic post, Nan. Thanks very much. Indeed, the ‘Axminster Gold’ comfrey looks like a real winner. Hope to find a source here in Victoria, BC. Heartfelt condolences to you and Duncan regarding Daniel. Thanks from both of us, Barbara. If I run across a Canadian source for ‘Axminster Gold’, I’ll let you know. And hey, if you happen to listen to Jeff de Jong’s “Gardening 101” radio program, I’ll be on this afternoon at 1pm your time! Great post as always, and exactly the kind of plants I love to see! I had to laugh though when I saw the comfrey in so many photos, just a few days before I had asked Broken Arrow to bring a plant down to a plant gathering in Downington so I could finally enjoy one of my very own. Of course you were to blame for that one, as well as the Gerald Darby which they also brought along. I may need to plant them and others in an Ode to Ondra bed which will be filled with all my copycat plants! I think spring will be back this weekend, that will be nice, but I was sorry to hear about Daniel. My condolences. Thank you, Frank. And thanks for the tip about Broken Arrow. Here’s a link if anyone would like to check out their online listing for the comfrey: Symphytum x uplandicum ‘Axminster Gold’. I’m glad to hear that you were able to get one from them, and some ‘Gerald Darby’ as well. I wish you a rain-free window to get them planted, if you haven’t already; it looks like we are in for a long spell of dreary days. But, at least it is not snow, sleet, or ice! :) A rain free stretch would be nice but snow free would be better! We still have at least half a foot which needs melting, and the rain should do nicely for that. Can’t wait to see what your garden does with rain again, I missed it last year. Yeah, I’m hoping the rain will get rid of our remaining snow too. I think we’re finally out of the drought conditions, or we soon will be. 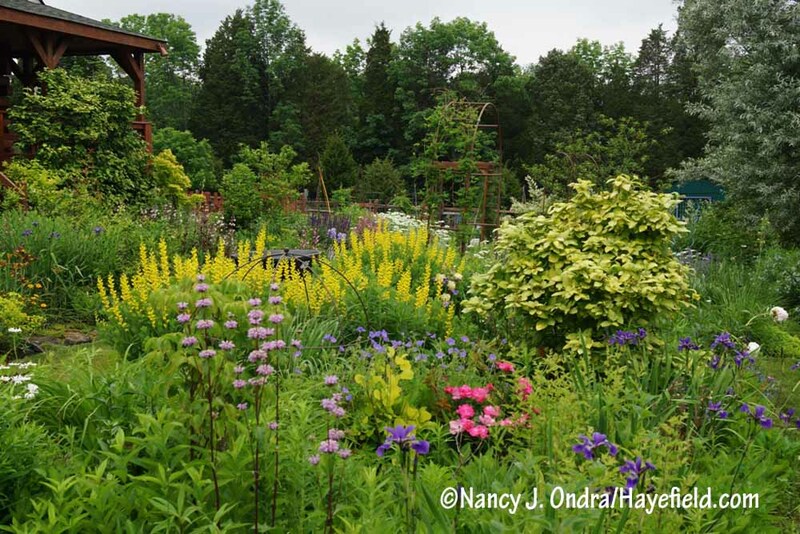 We’ll hope for a gentler growing season to the benefit of gardens everywhere!